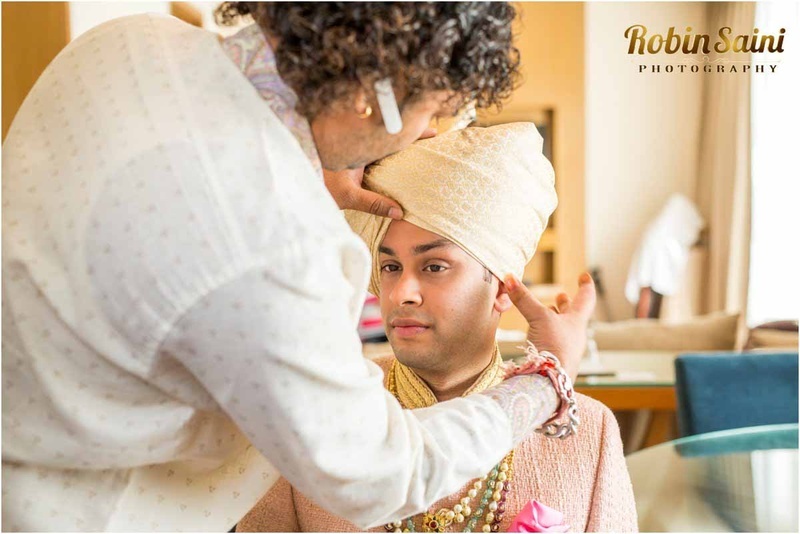 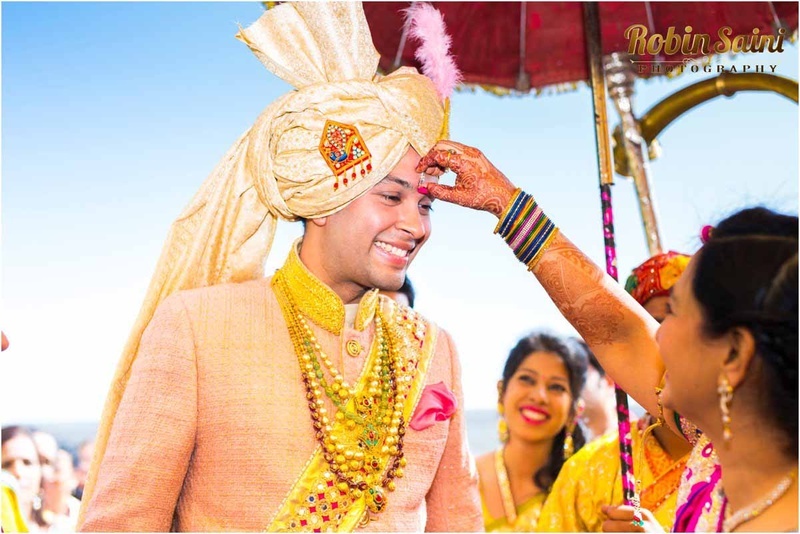 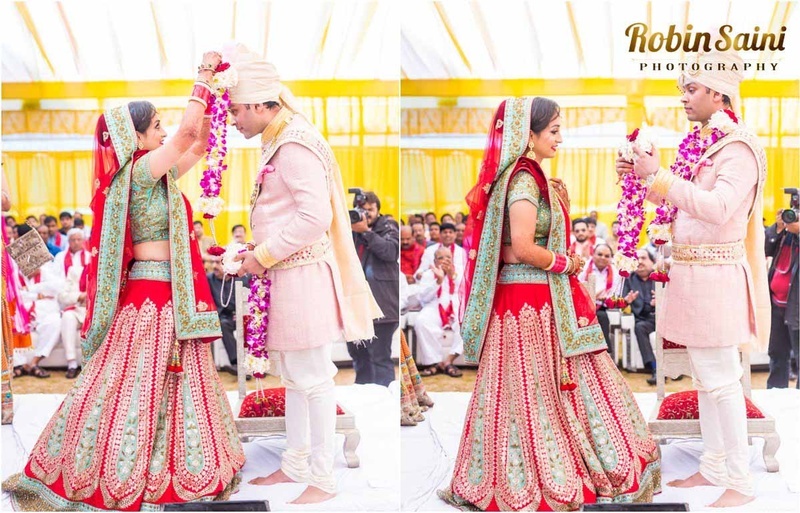 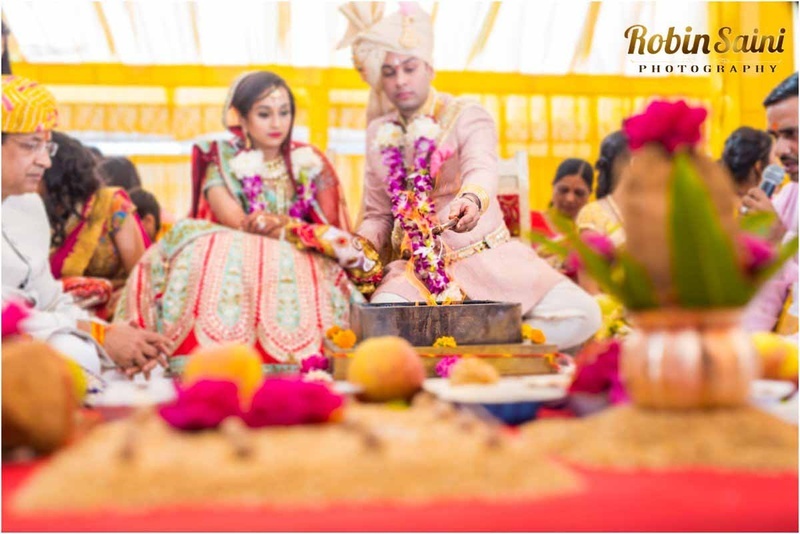 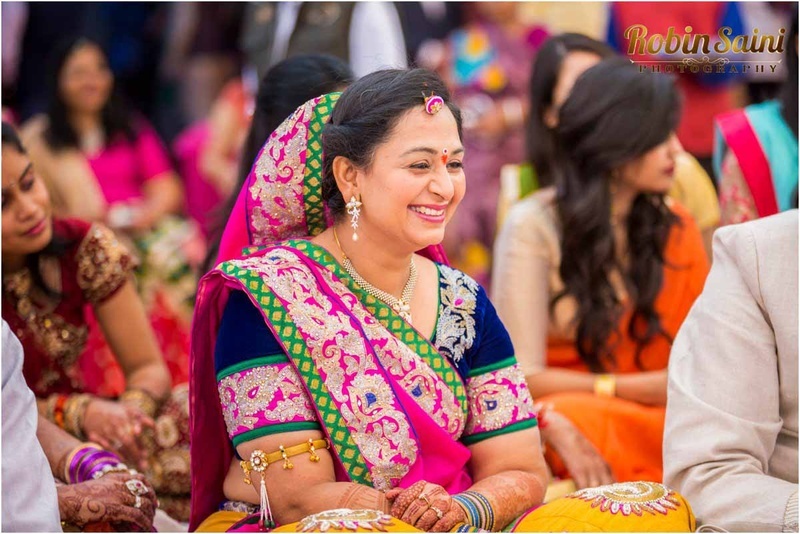 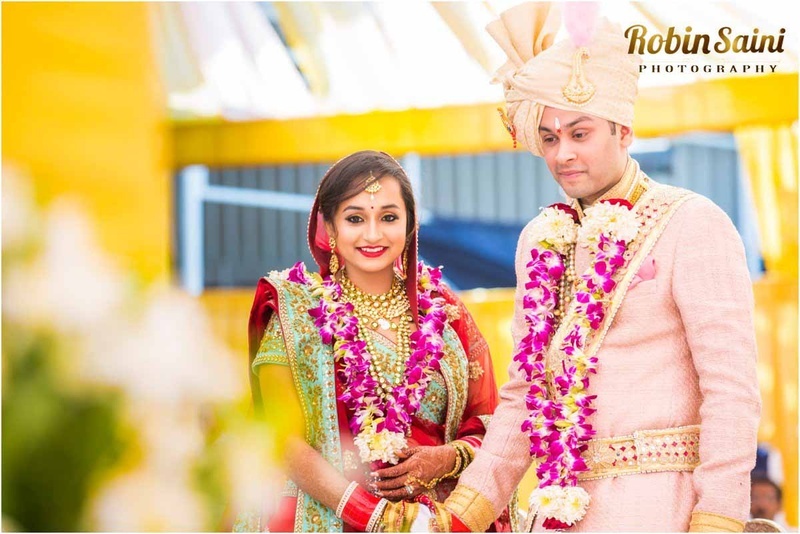 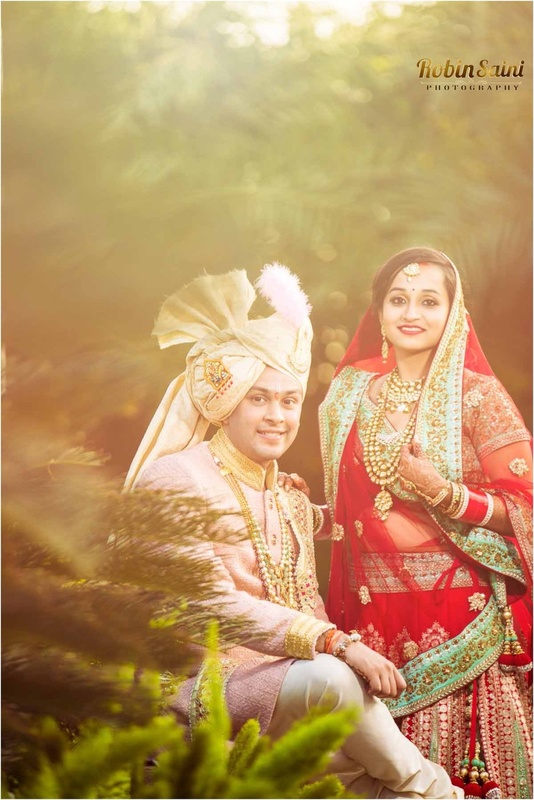 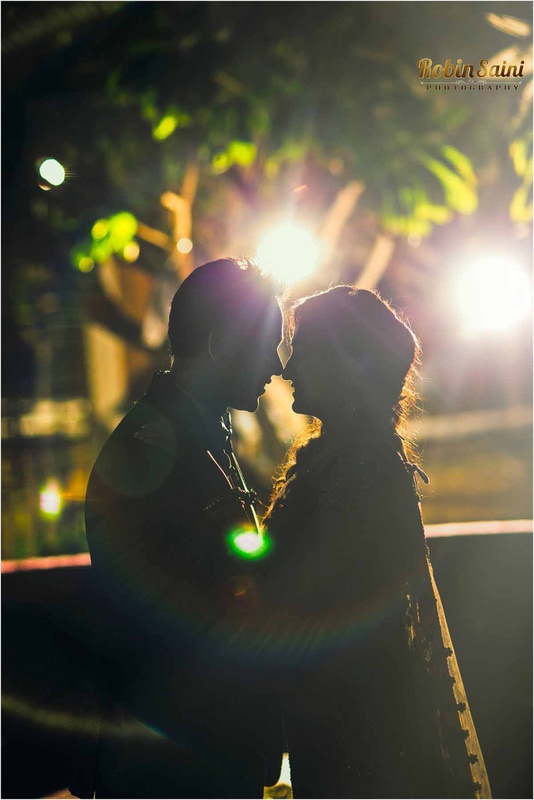 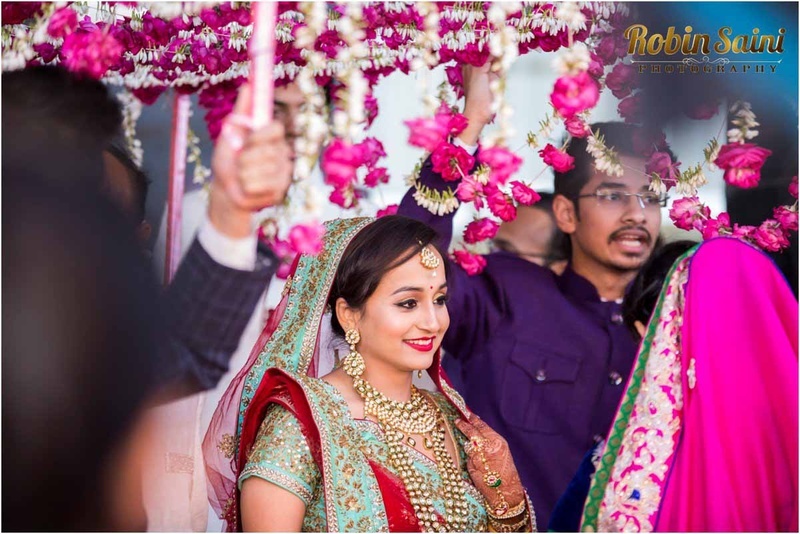 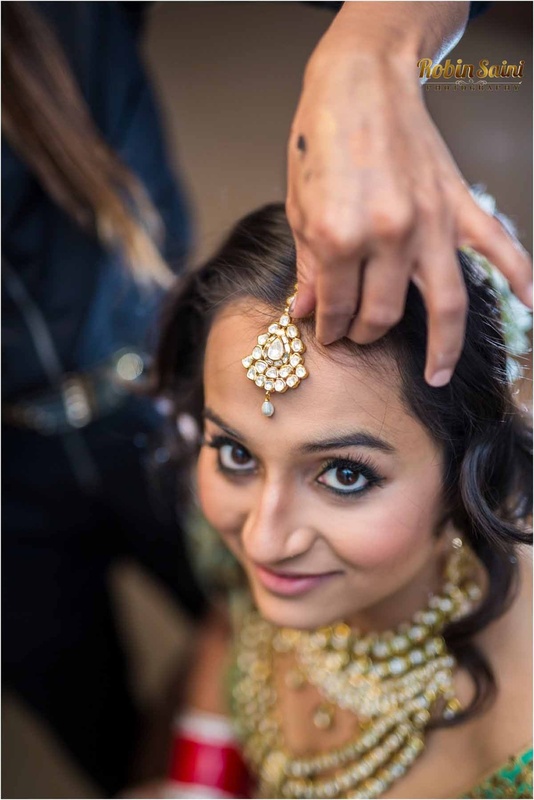 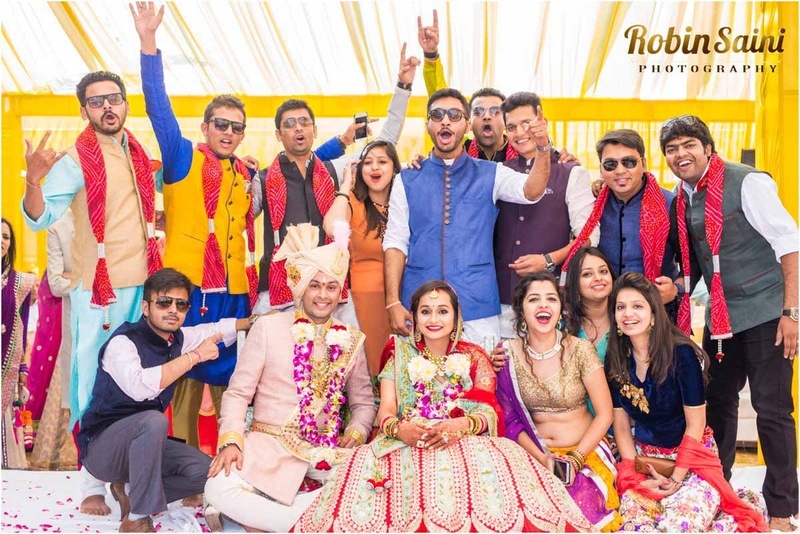 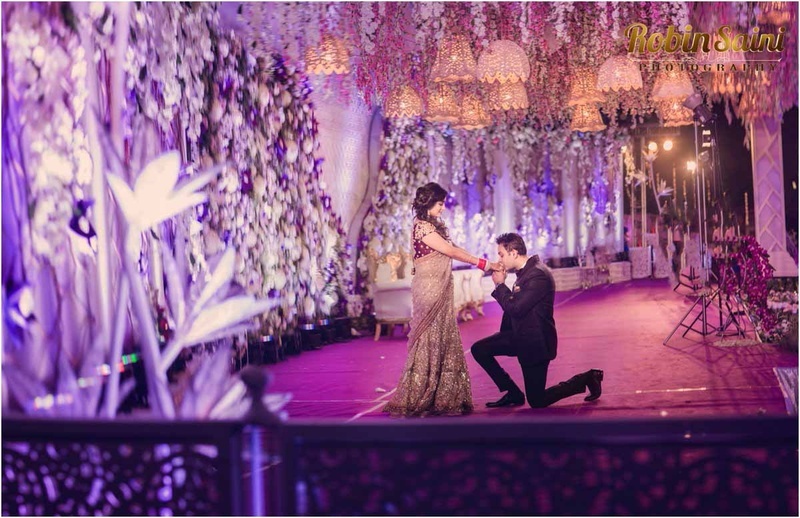 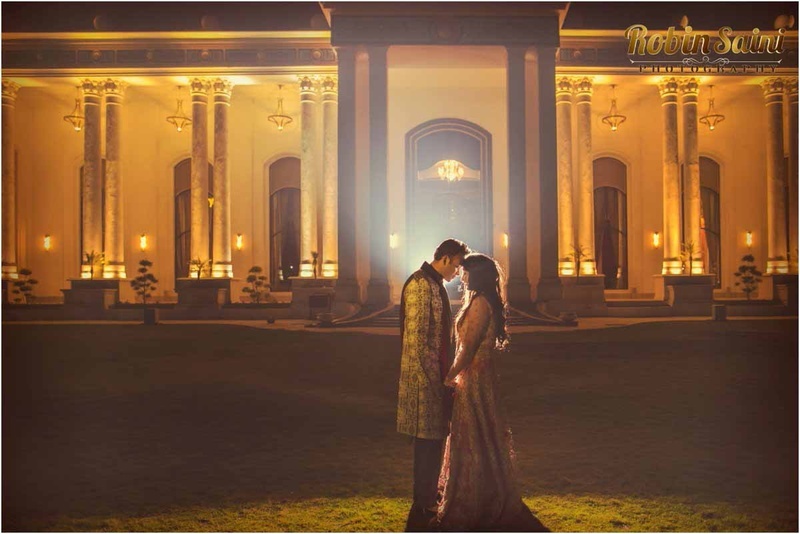 Abhishek and Akruti’s Big Fat Indian Wedding was all things magnificent, and then some.Believe us when we say that each photo out of this album will leave your jaw dropped right to the floor. 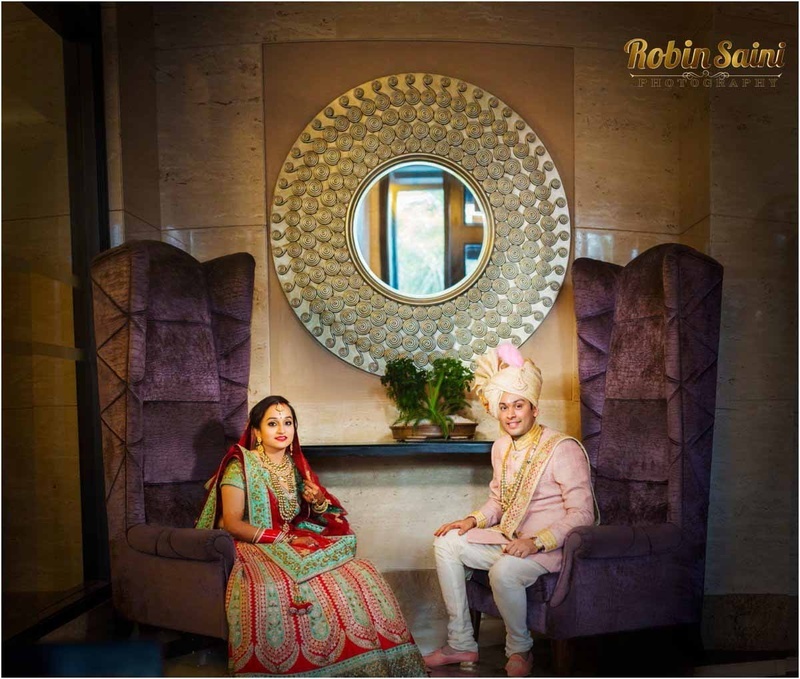 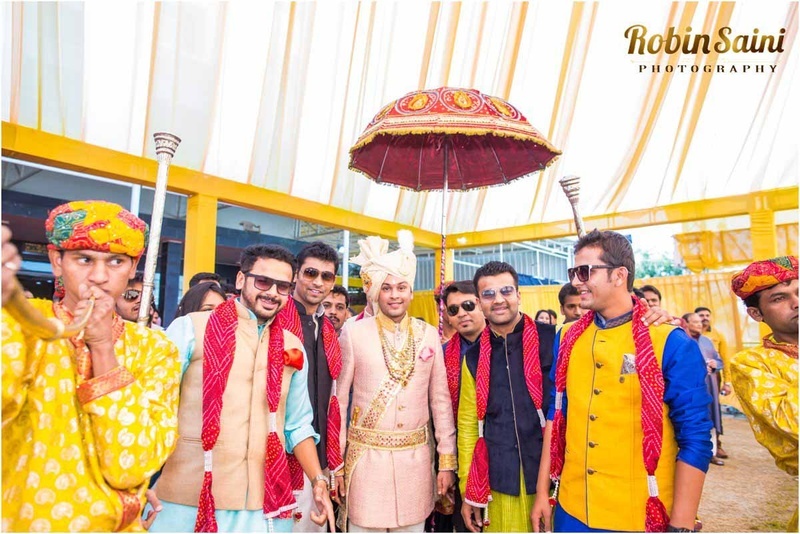 A ten daylong celebration that ran across two cities and some celebration up in the air too ;) From a Moulin Rouge Themed Kumkum to a private jet hired for the baarat and all the bold-blingy details at the reception, this wedding hit all the right notes in the making of this supremely extravagant wedding affair shot brilliantly by Robin Saini Photography. 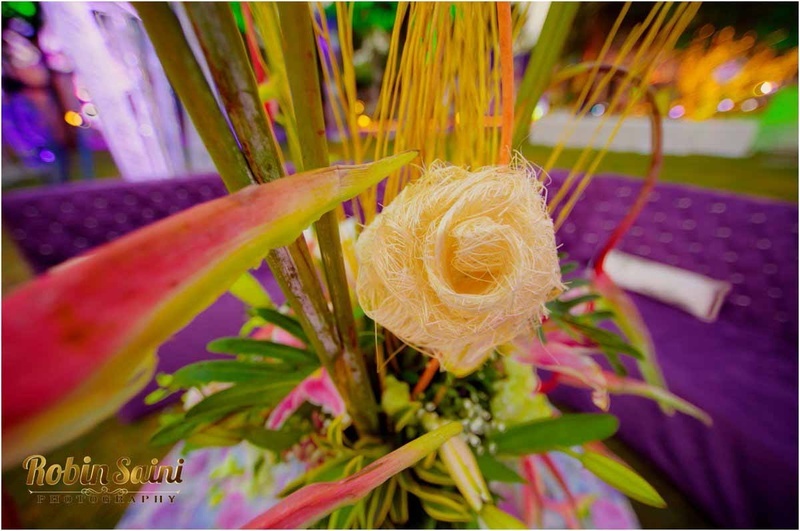 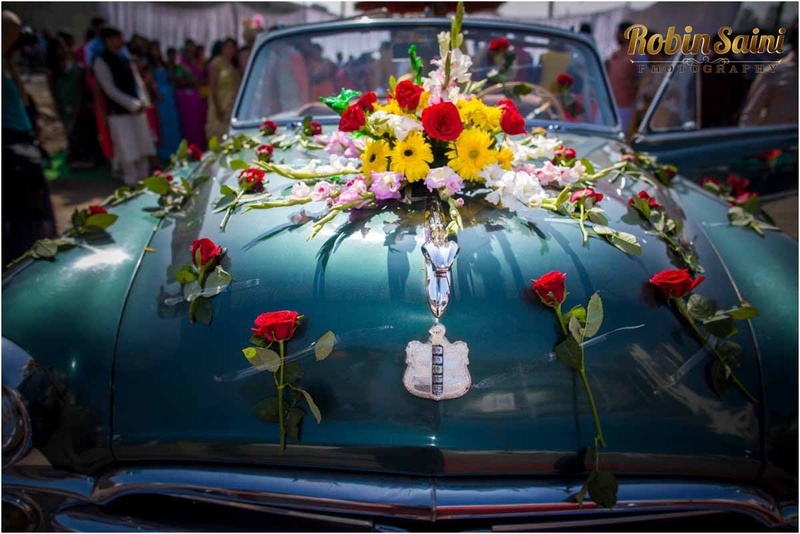 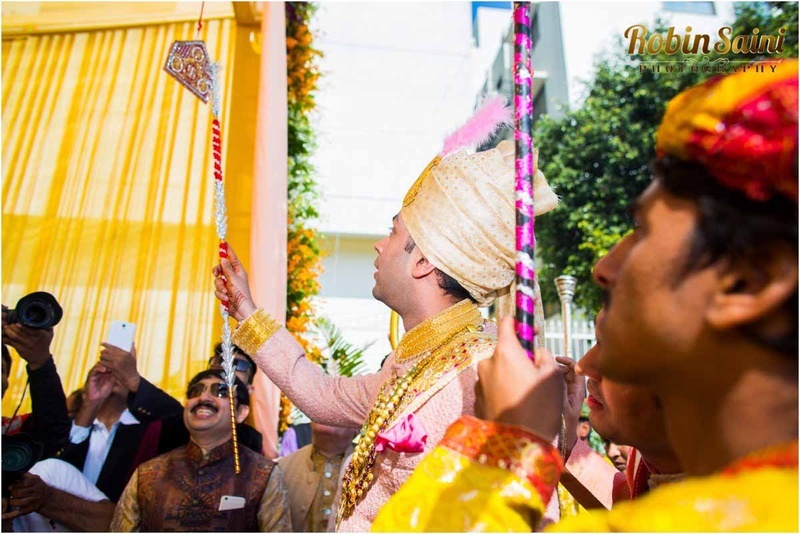 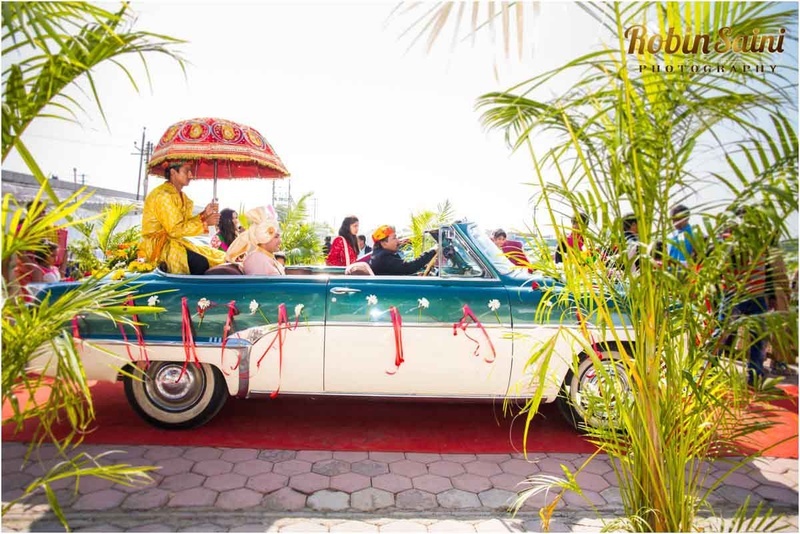 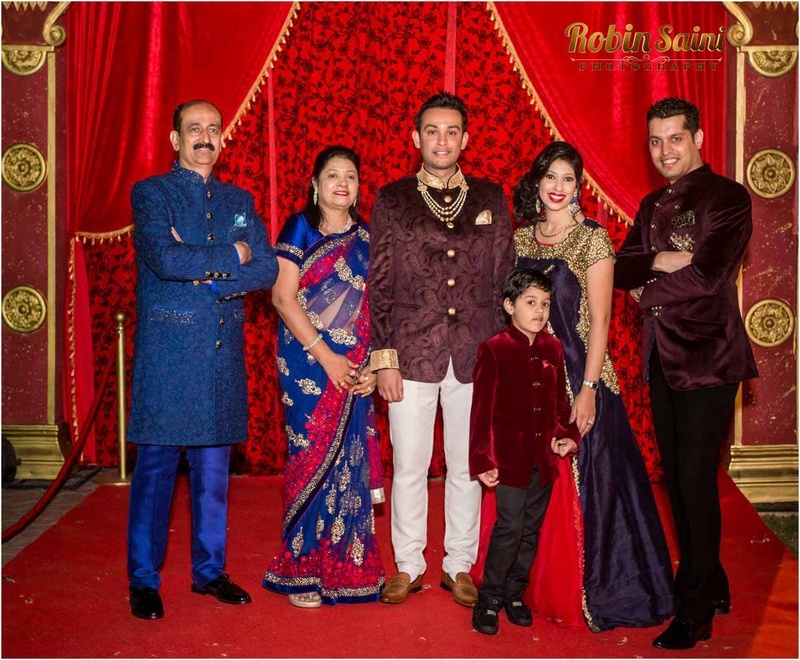 The grandiosity began with the Moulin Rouge themed Kumkum ceremony held for the groom, Abhishek at The Corinthians Resort, Pune. 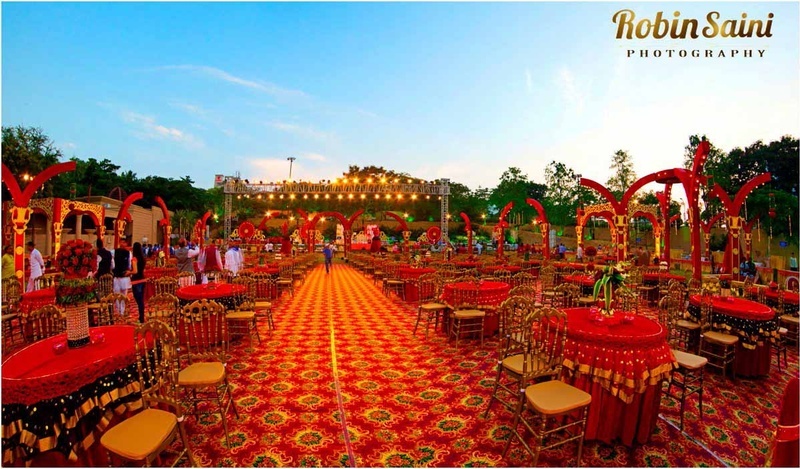 Set in a regal theme of red and gold where each element was matched to the theme, right from chairs to table covers, to stage décor and centerpieces too. 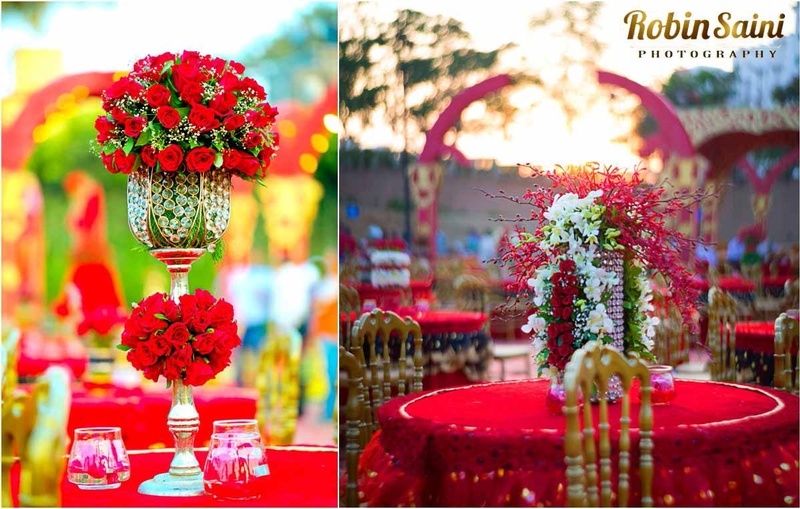 Gold hued napoleon chairs were paired with tables covered in deep red. 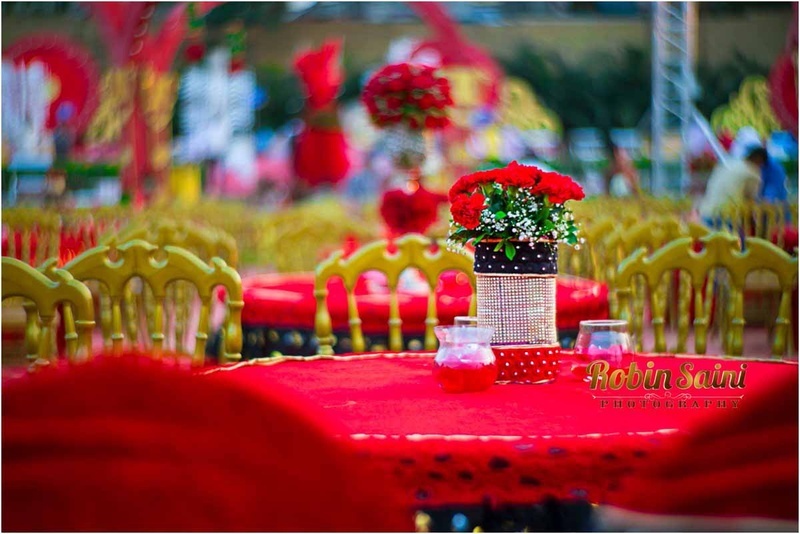 Creative red rose centerpieces set on each table, upped the glam factor at the ceremony by a ton. 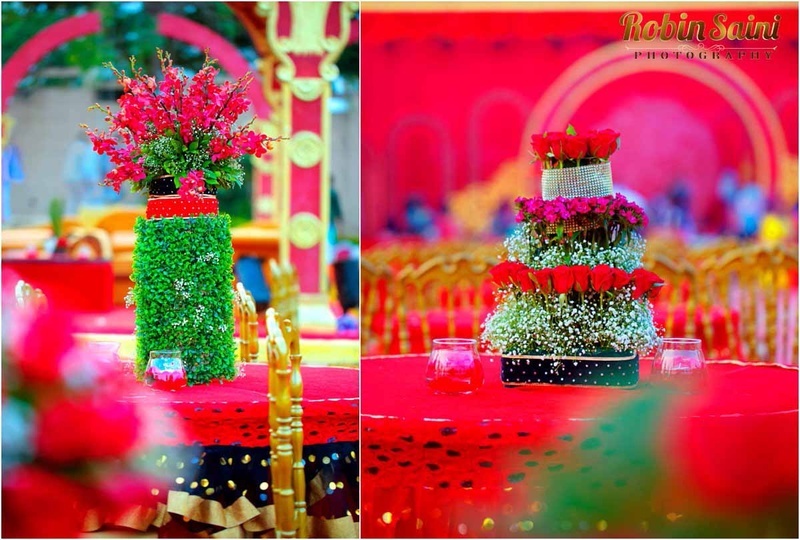 A mixture of crystals along with baby’s breath and fresh green ferns gave these centerpieces a feel of the unusual and looked oh-so-pretty too! 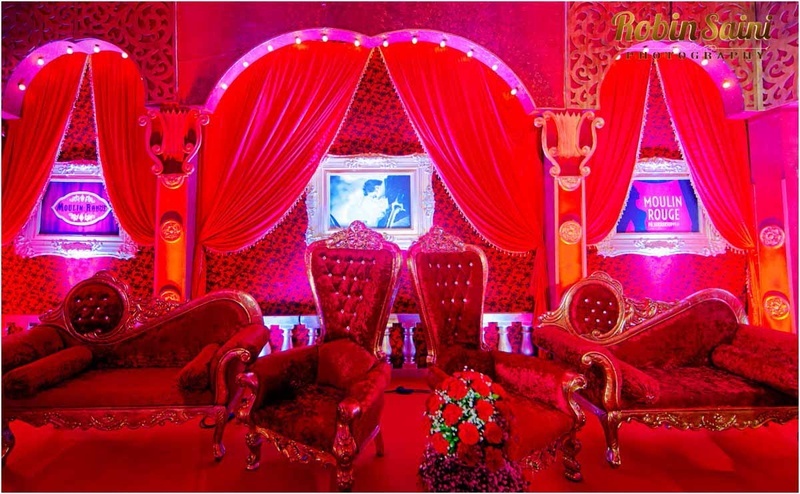 The classy Moulin Rouge themed photobooth of sorts was set up complete with the jazzy lights, velvet cushioned thrones and pictures of the couple hug graciously for a personalized feel. 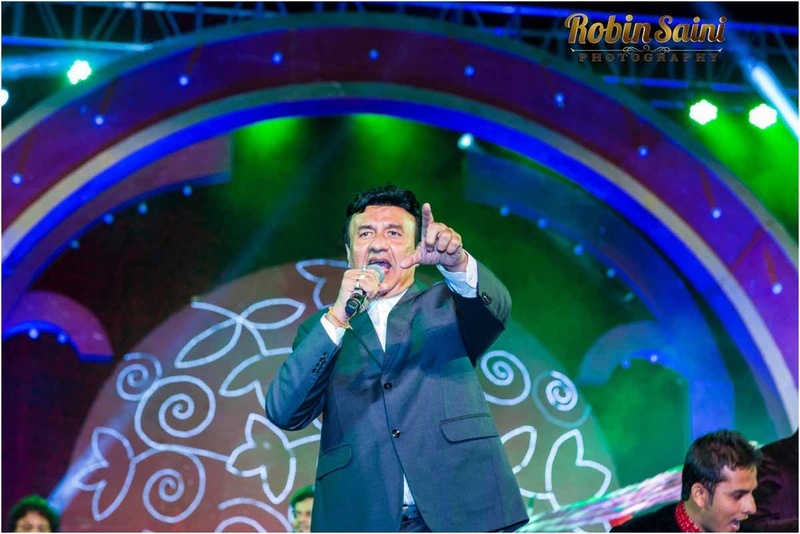 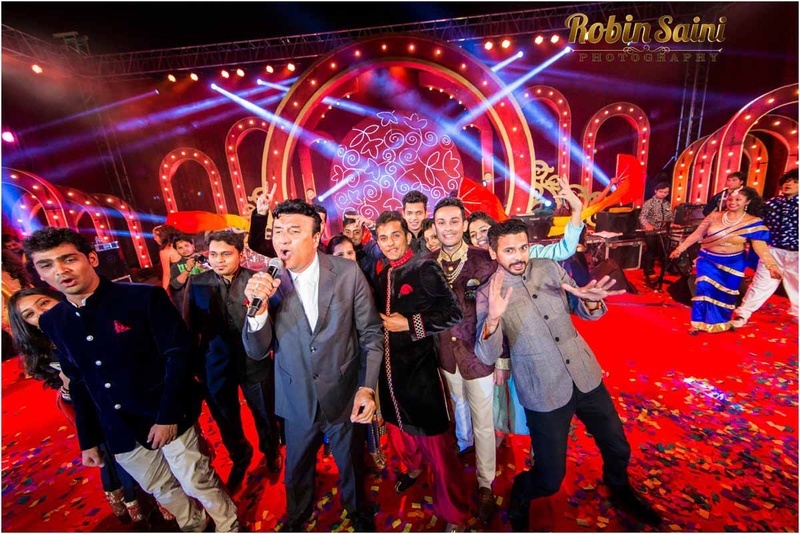 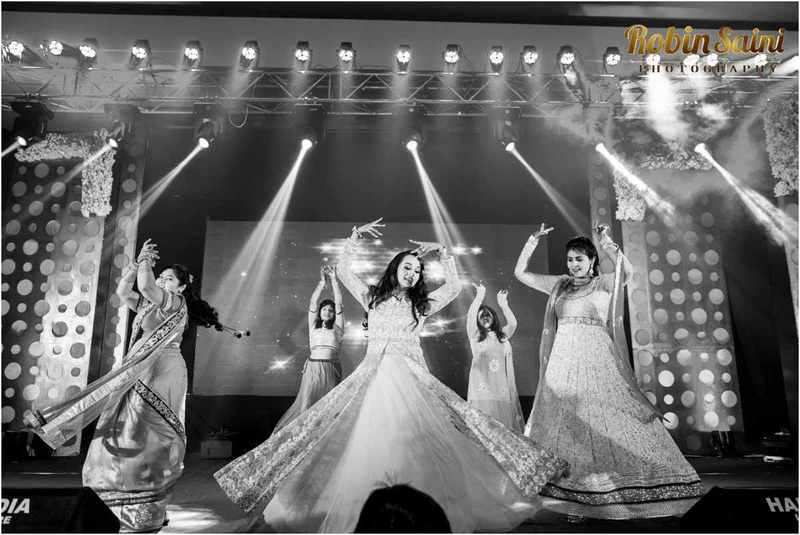 Professional dancers along with ace playback singer Anu Malik bringing in that Bollywood feel to this classy pre-wedding ceremony. 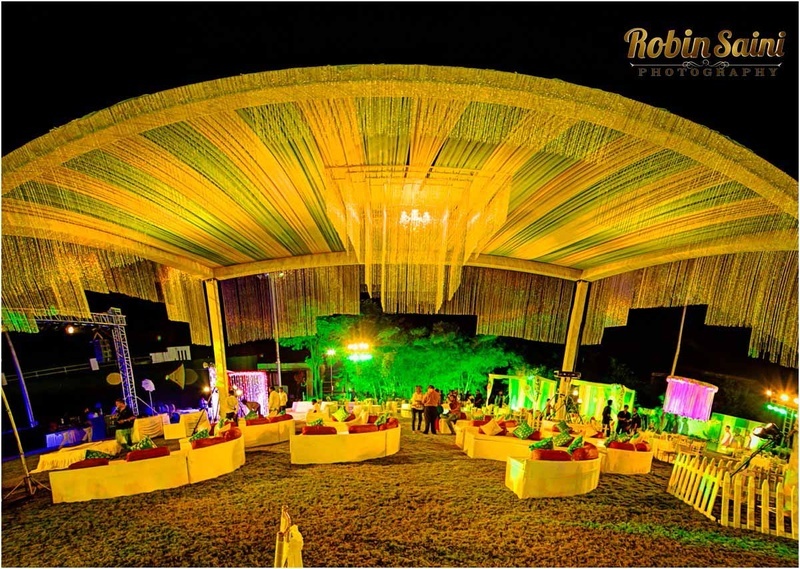 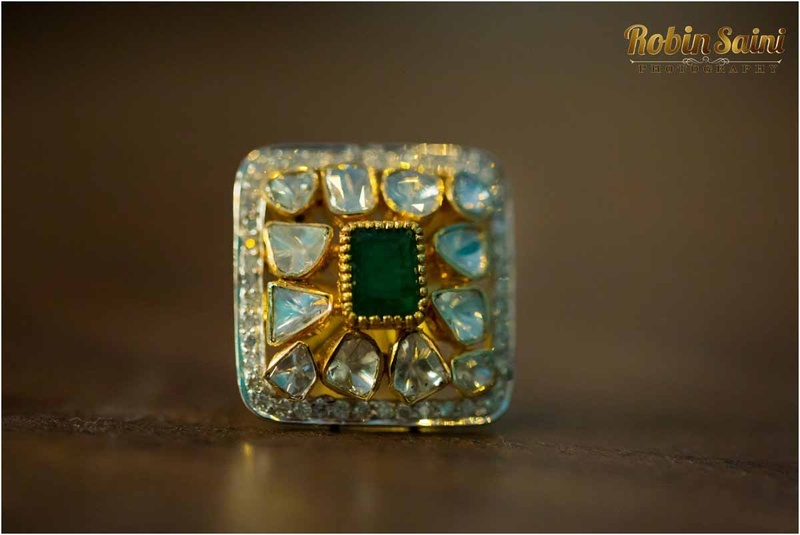 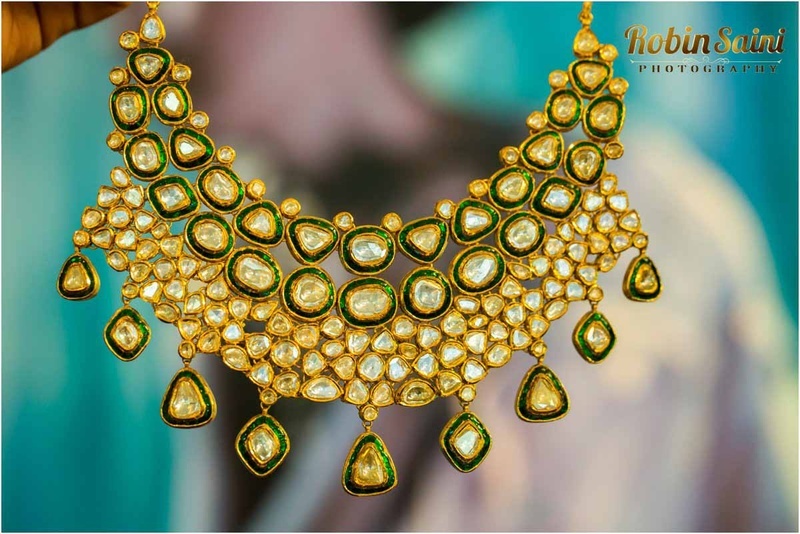 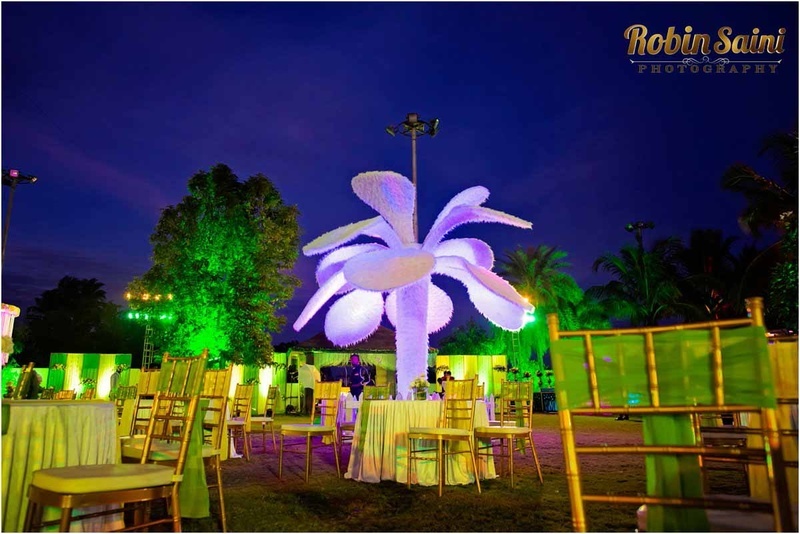 Next rolled in the Boys’ side sangeet ceremony held at Yash Lawns, Pune set in hues of lemon yellow and greenwith décor that will make you say “I want that at my wedding!” for real. 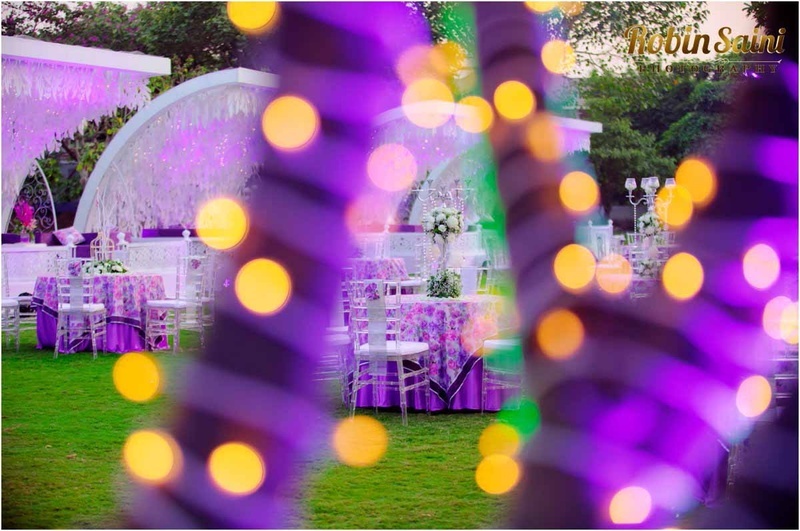 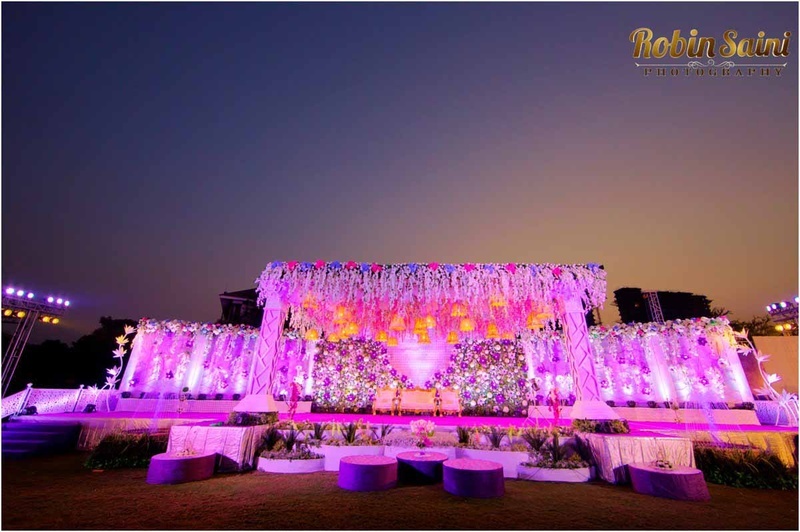 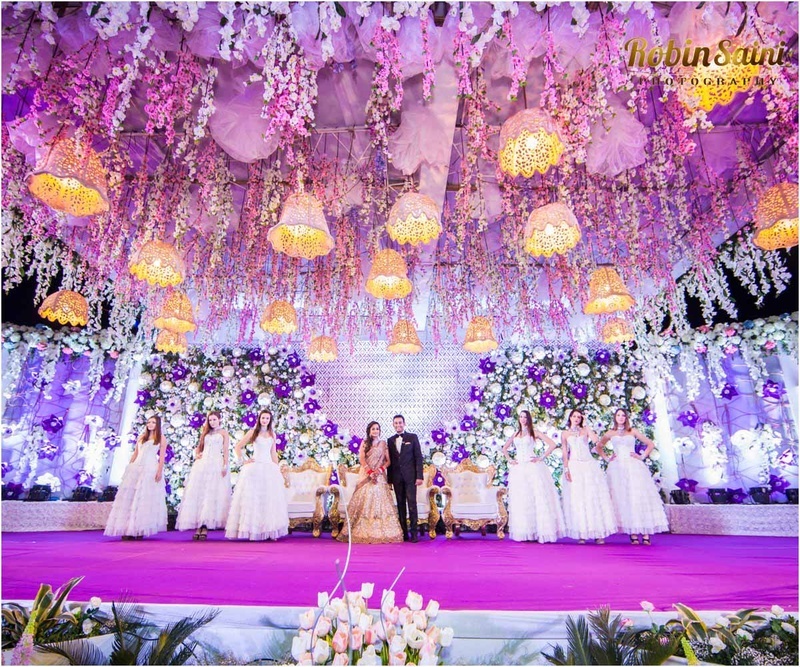 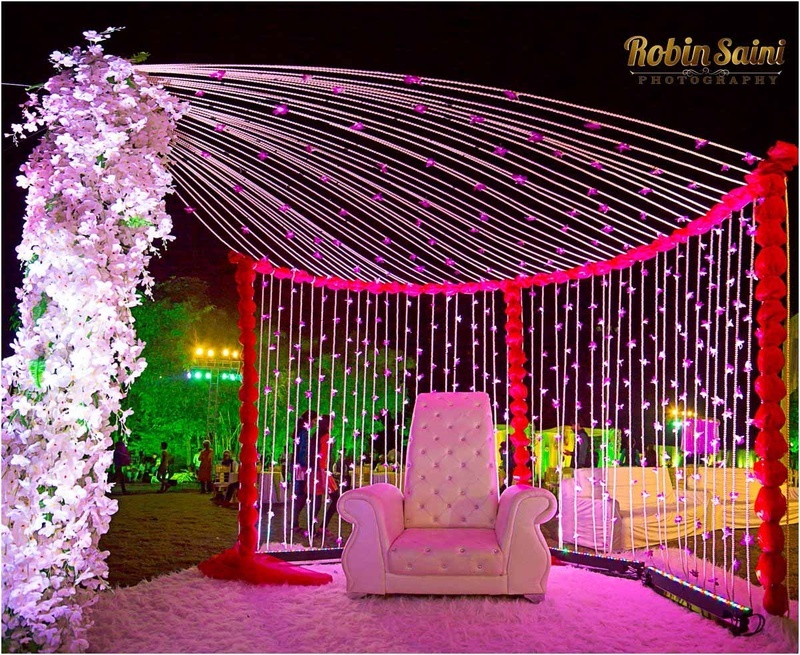 Pearl string canopy adorned with pretty purple orchids, gold chivaris with gorgeous gold tissue tie backs and the larger-than-life structure with white petal pastings – we could just go on and on! 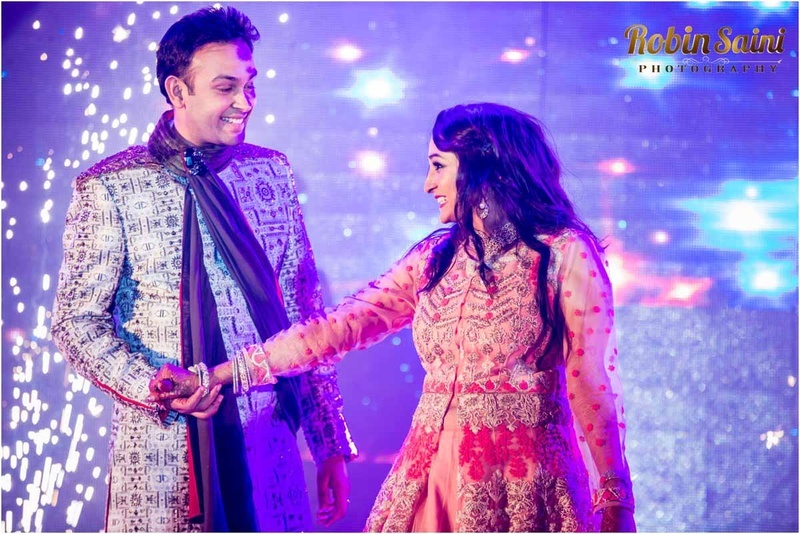 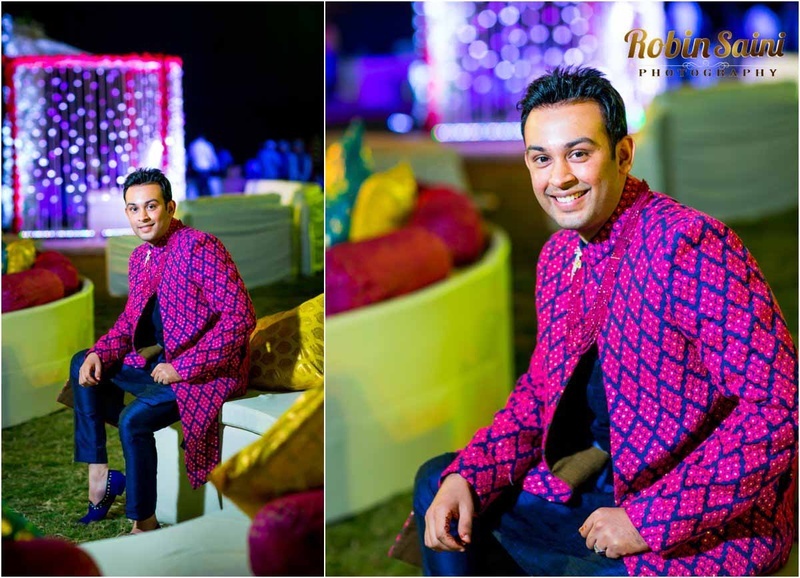 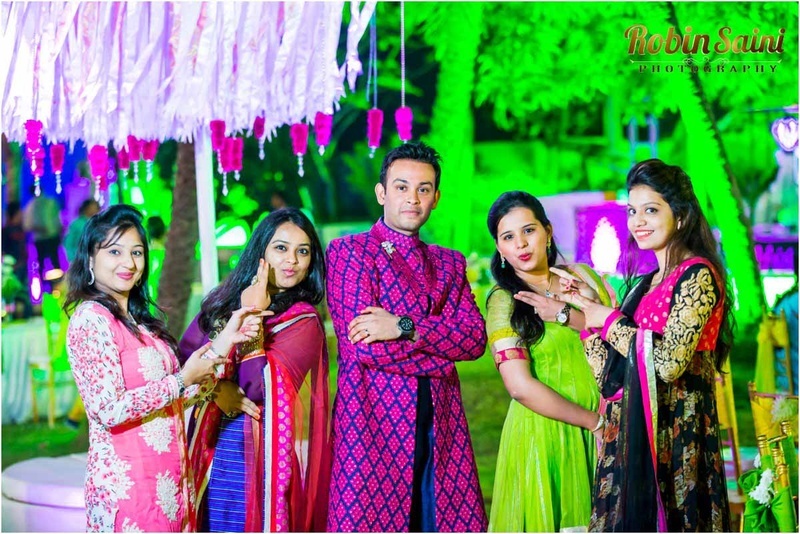 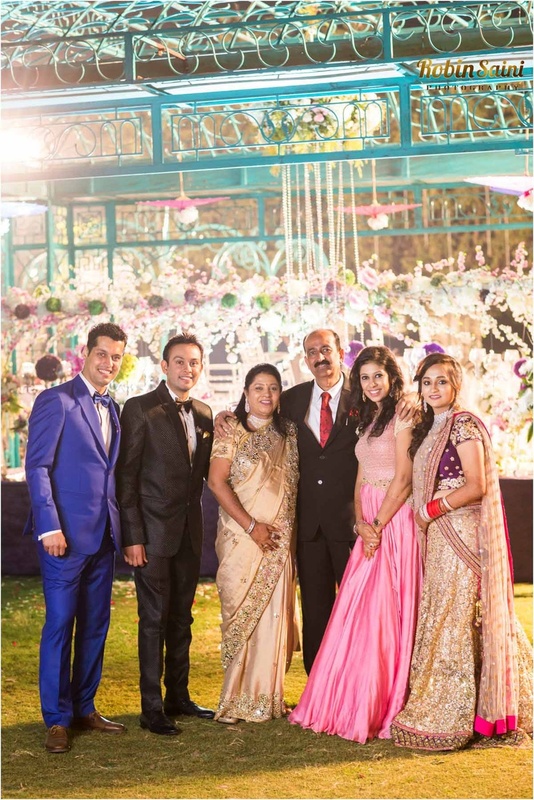 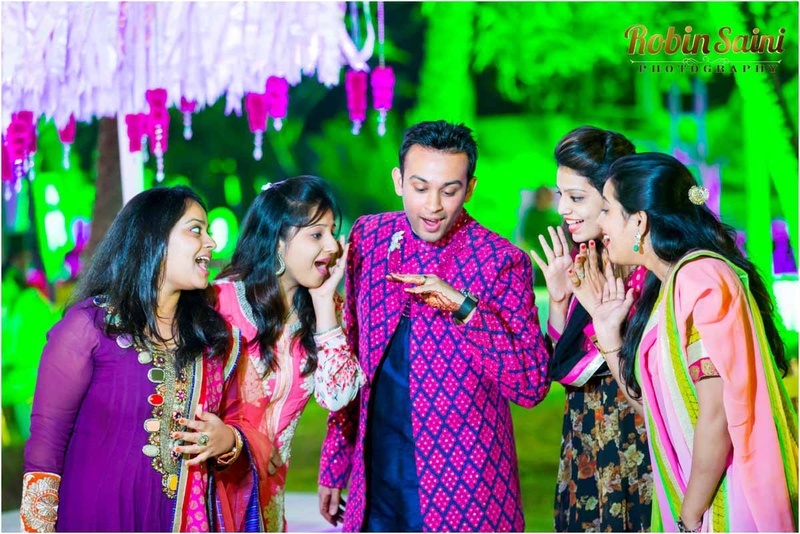 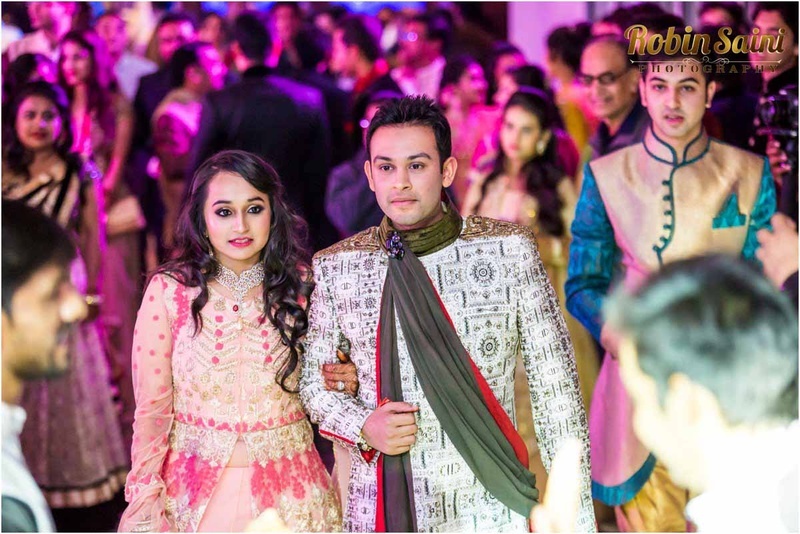 Dressed in a pink and navy blue jamewar silk sherwani, Abhishek looked an uber stylish groom-to-be. 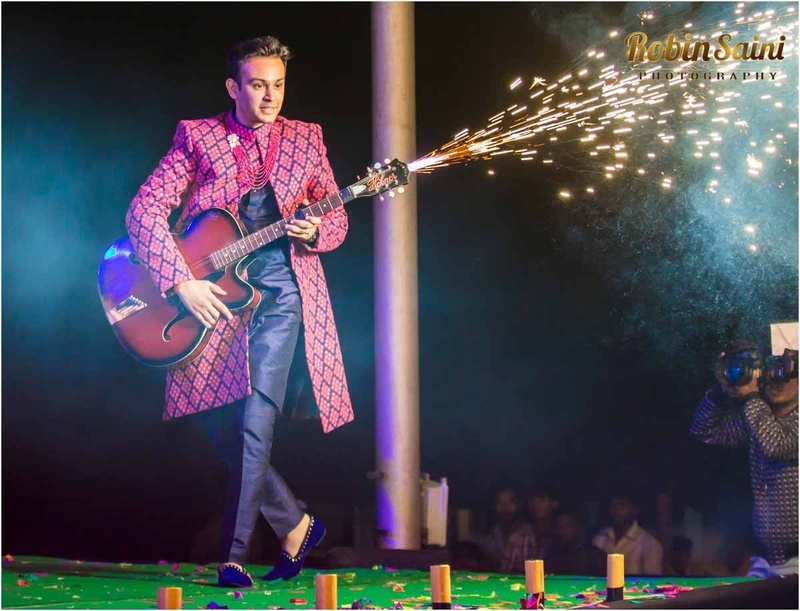 And when it was time for him to perform with his boys? 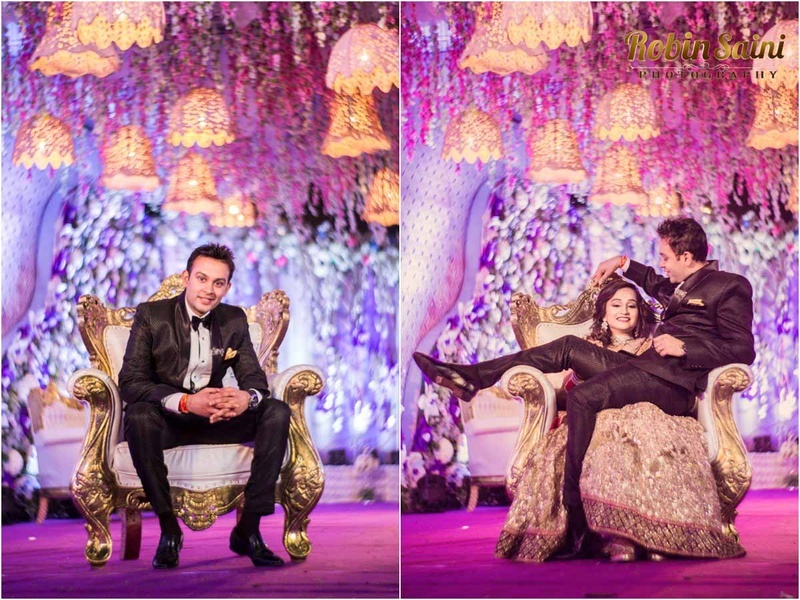 The level of ‘cool’ only seemed to level up with this dapper groom. 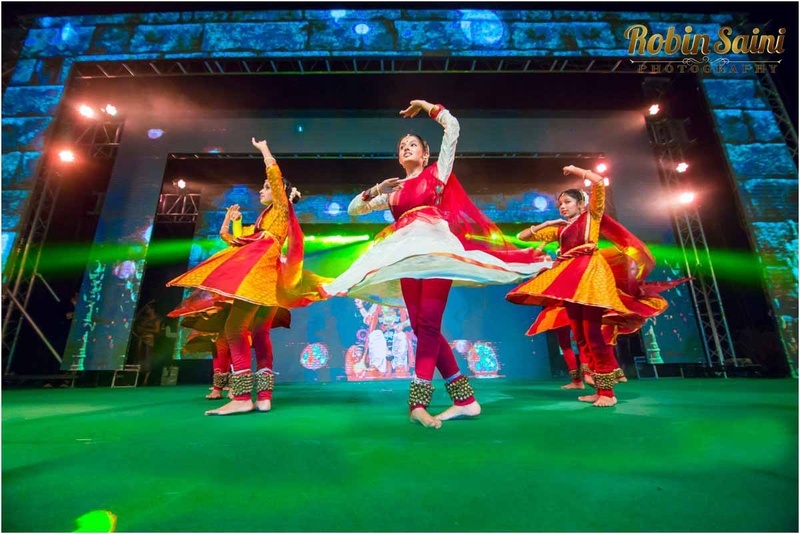 Baarat Heads To Indore Okay, here’s the part that will leave you stunned. 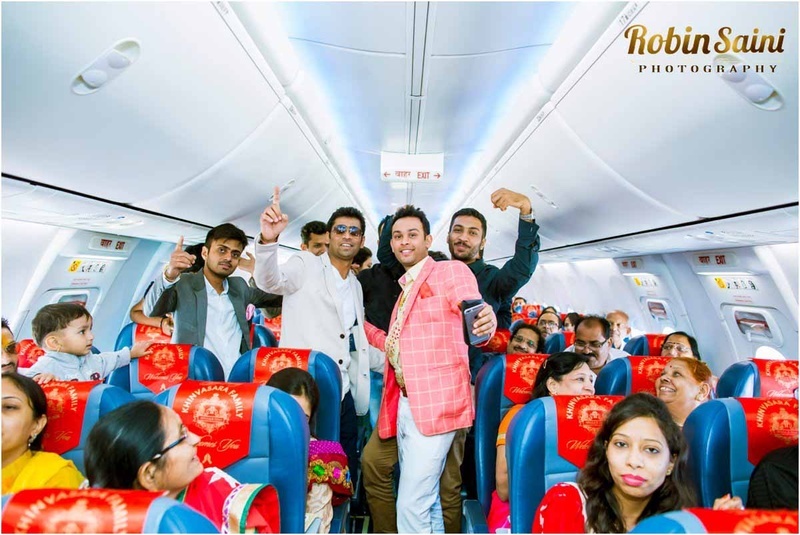 The well-known Khinvasara (grooms) family hired a private jet to take all their baaratis to Indore for the wedding. 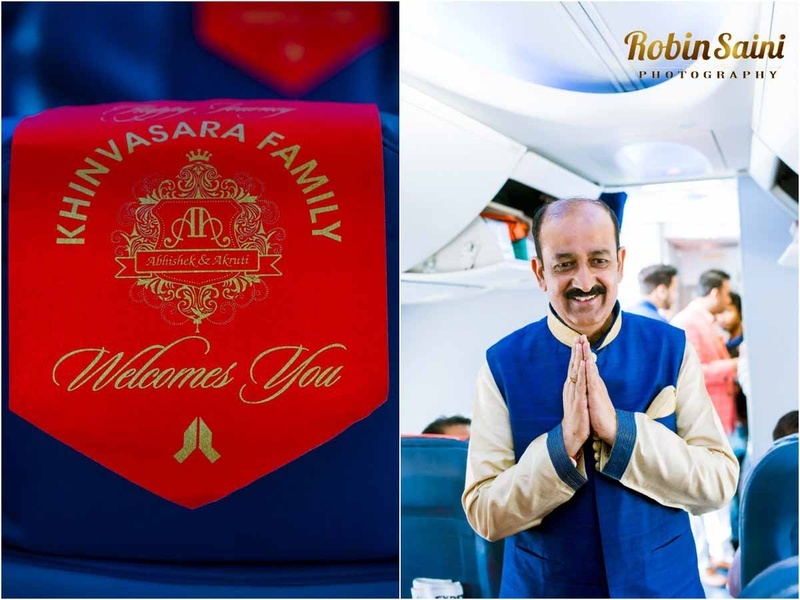 What made this flight 8373 times more special were the personalized Khinvasara family logo on the airplane seat headrest covers – talk about setting the bar high! 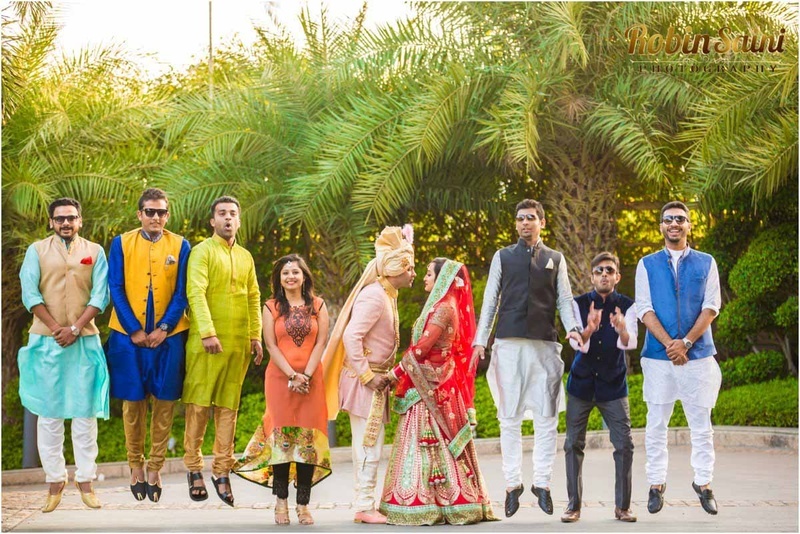 #PunIntended. 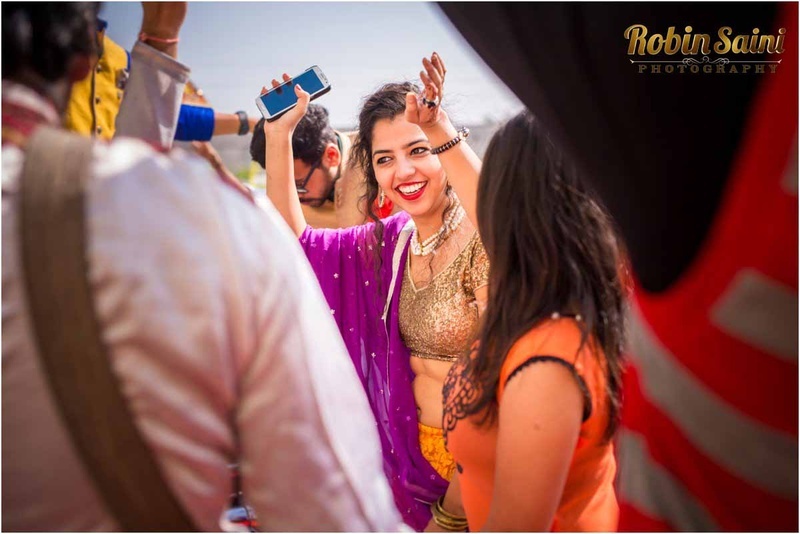 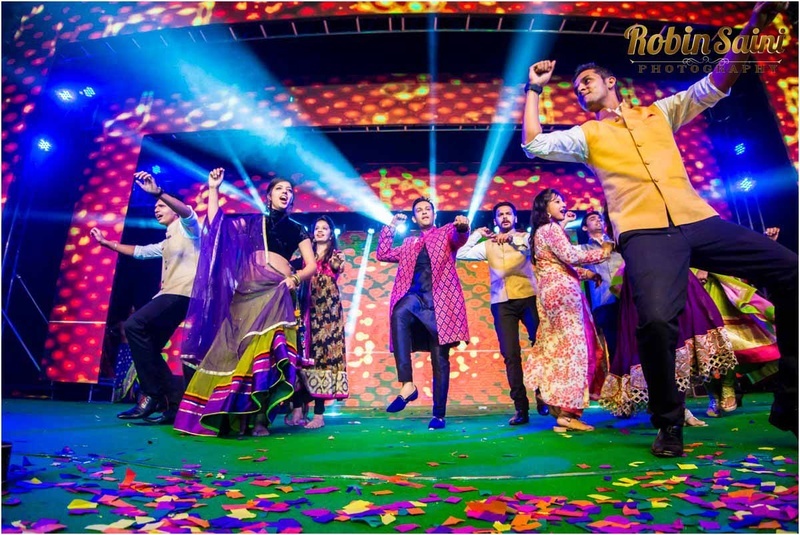 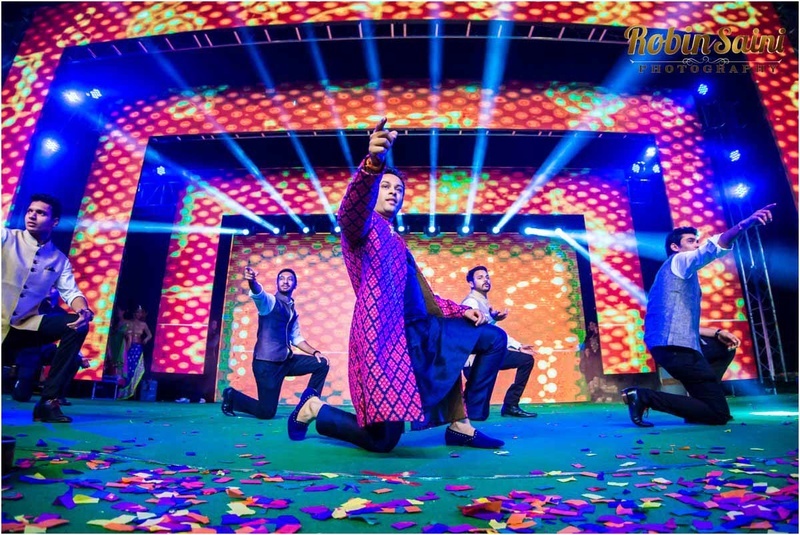 It is a fact known far and wide that the naach-gaana at Indian weddings never ceases, and Abhishek and Akruti followed suit with sangeet # 2! 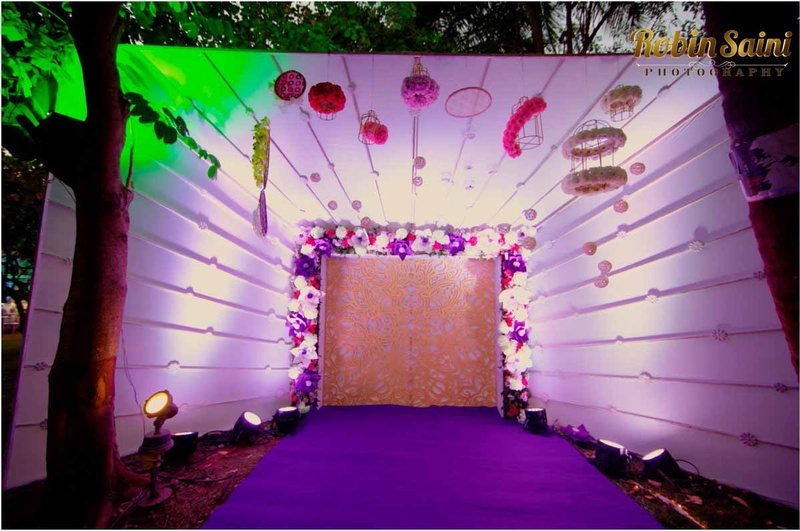 This was a more intimate affair held indoors with minimal décor and loads of lights. 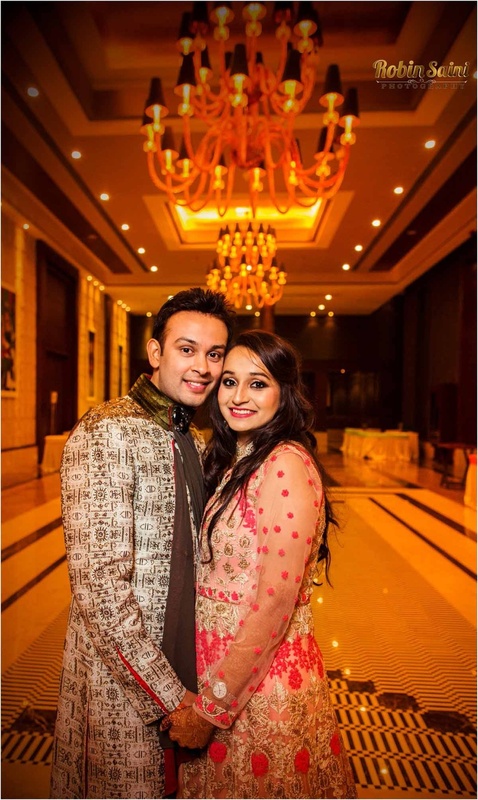 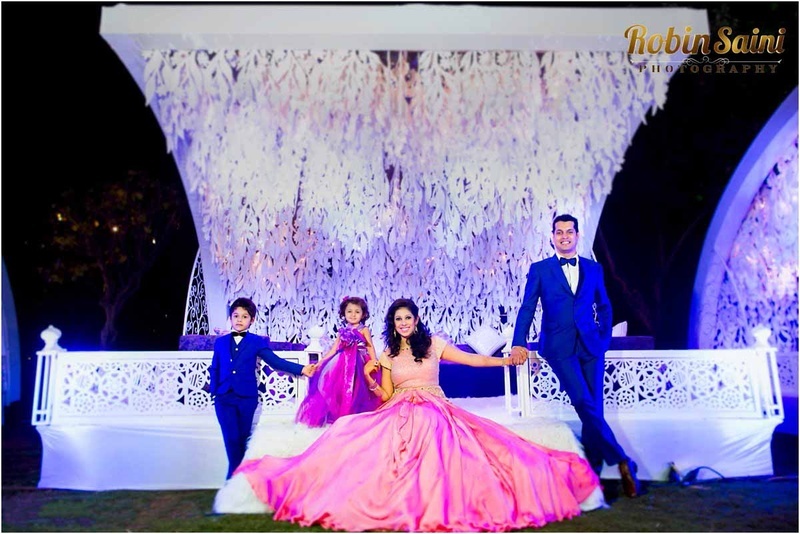 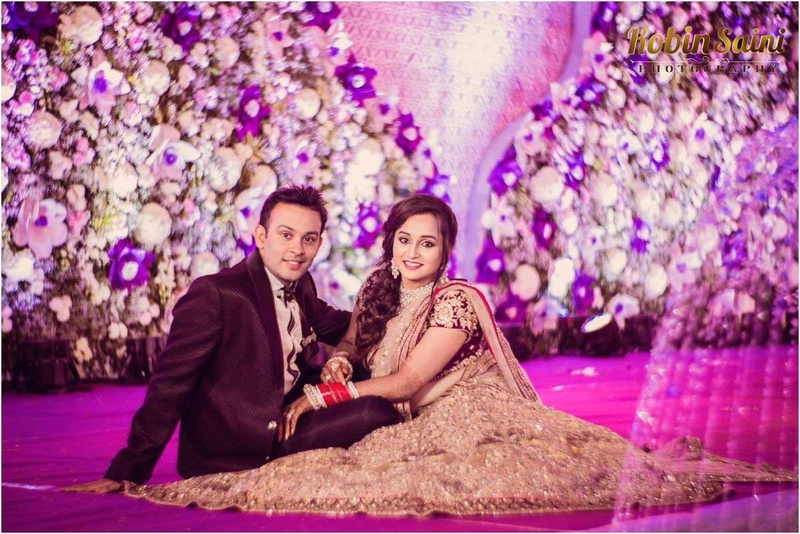 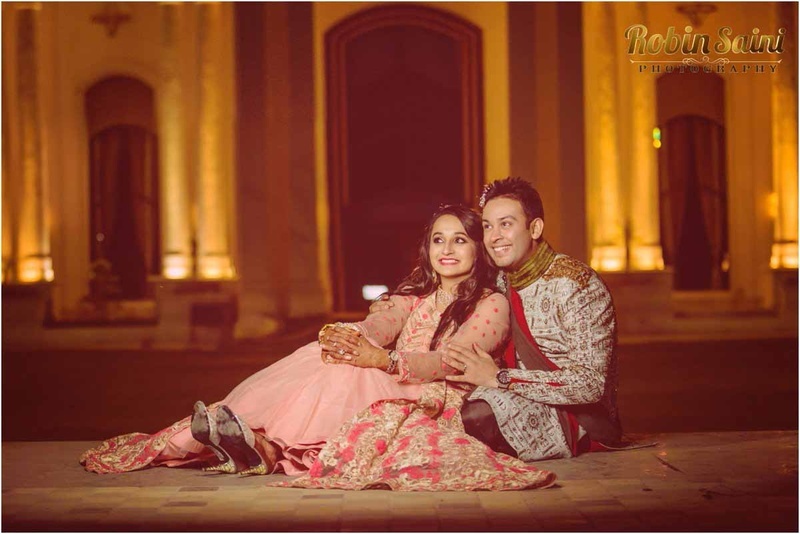 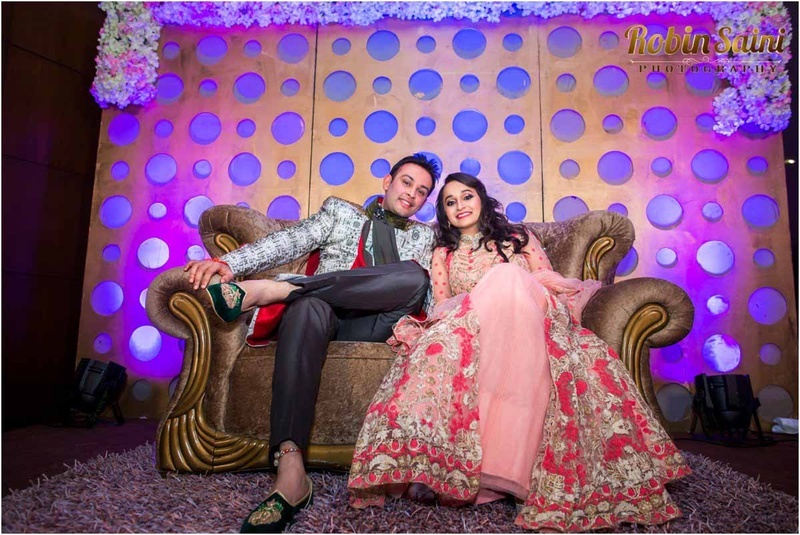 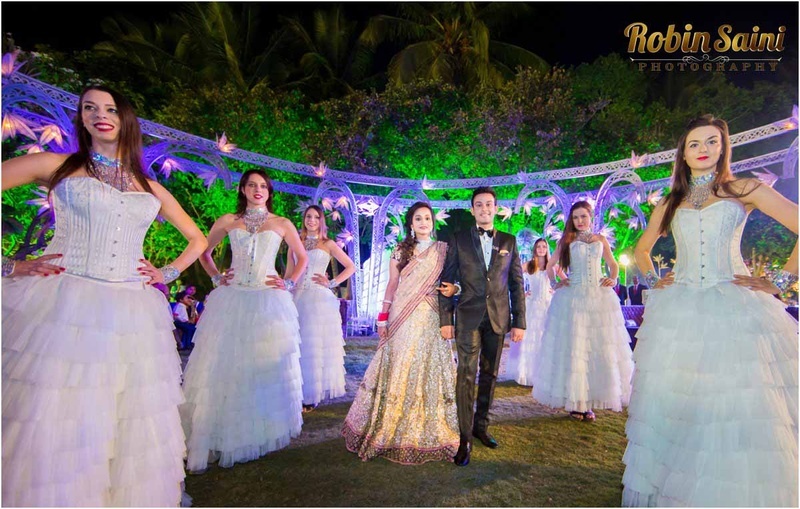 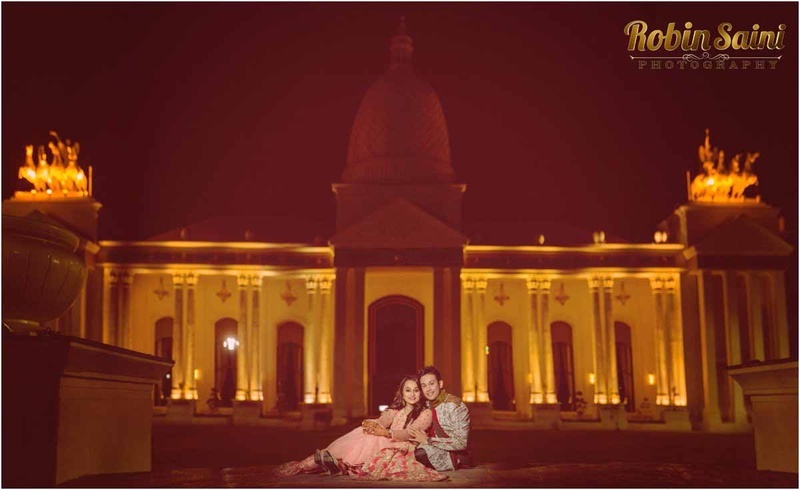 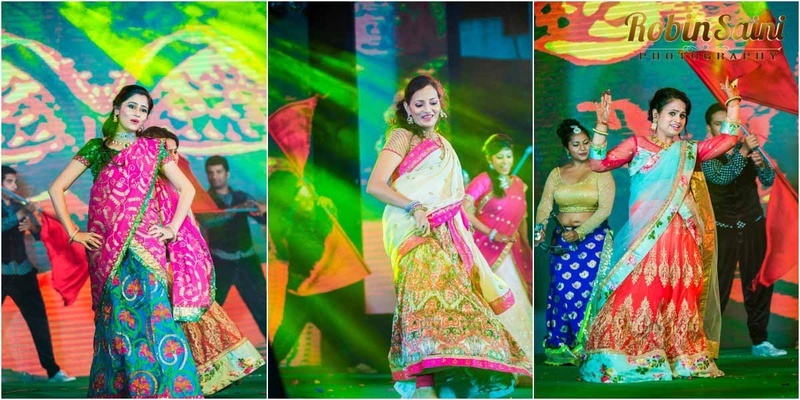 The bride-to-be, Akruti looked ravishing in a pretty peach and pink anarkali lehenga with gorgeous diamond jewellery. 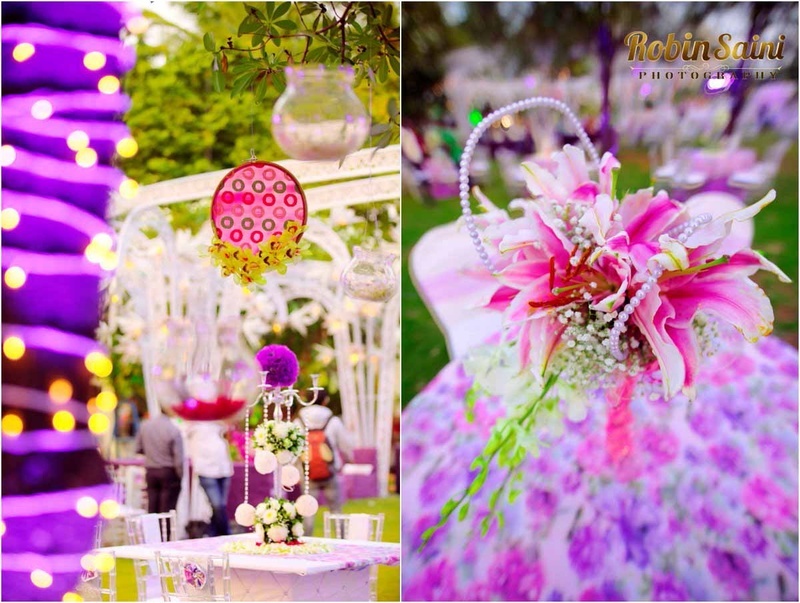 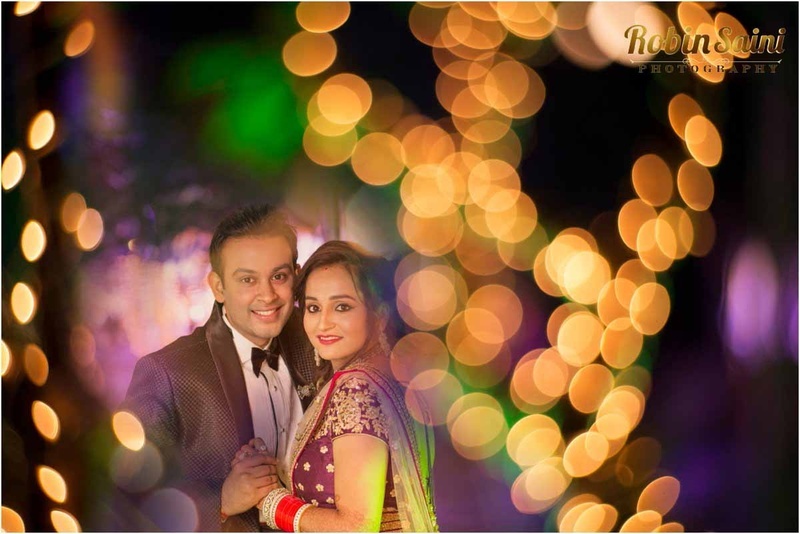 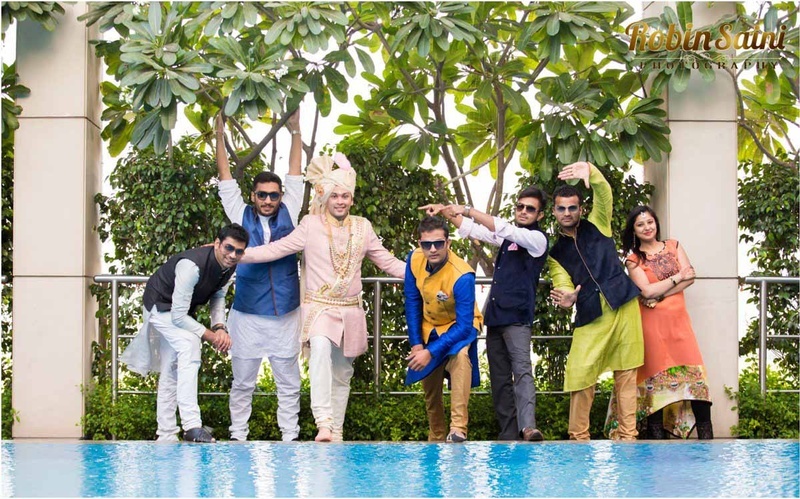 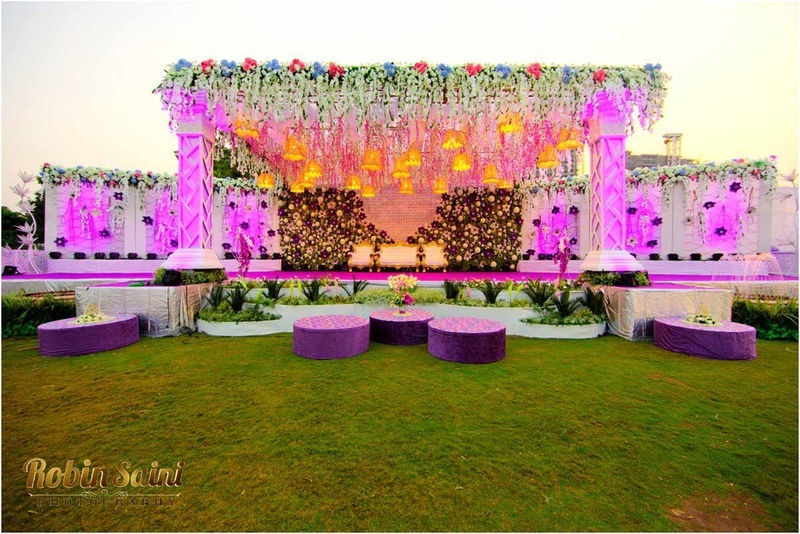 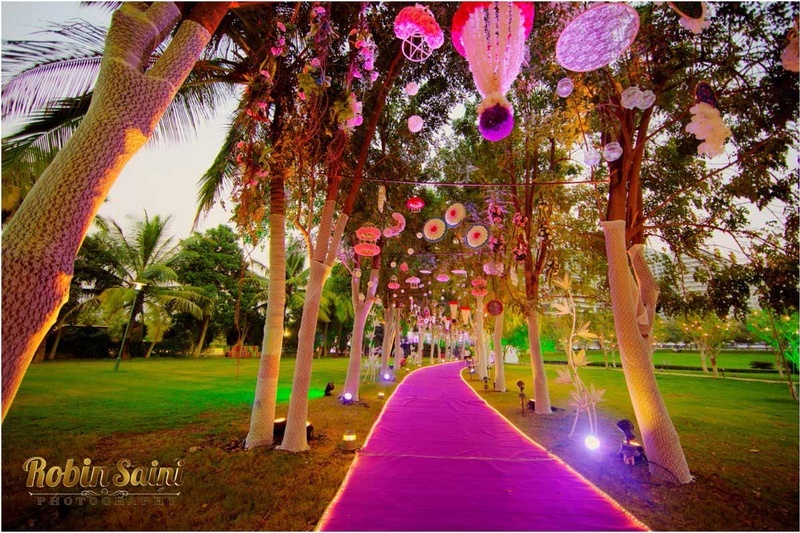 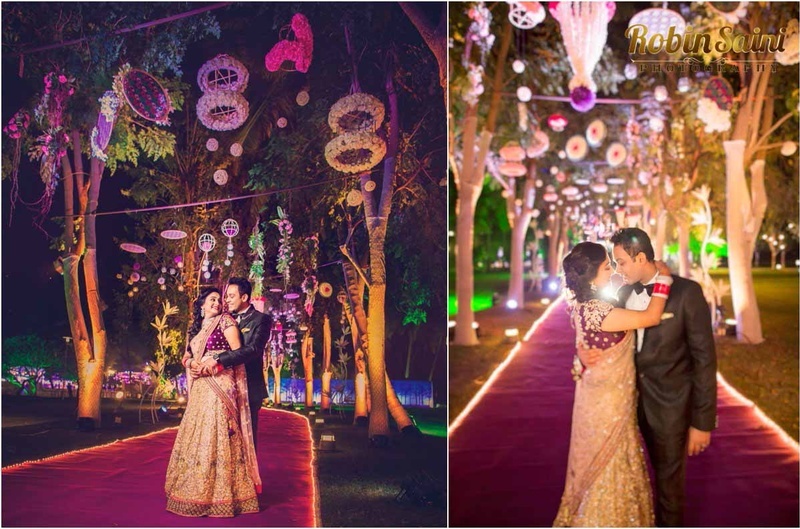 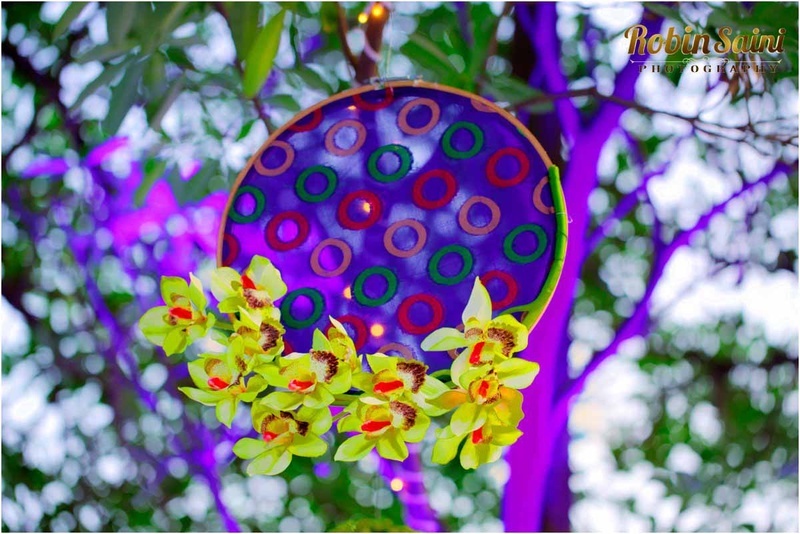 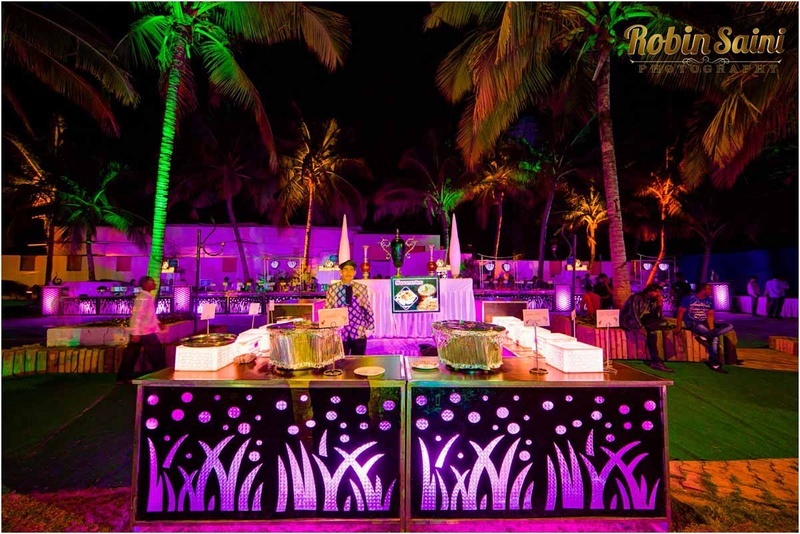 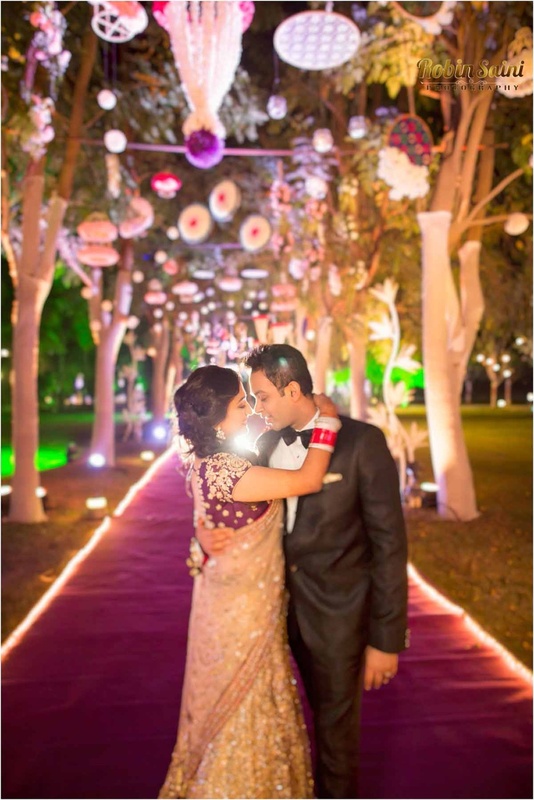 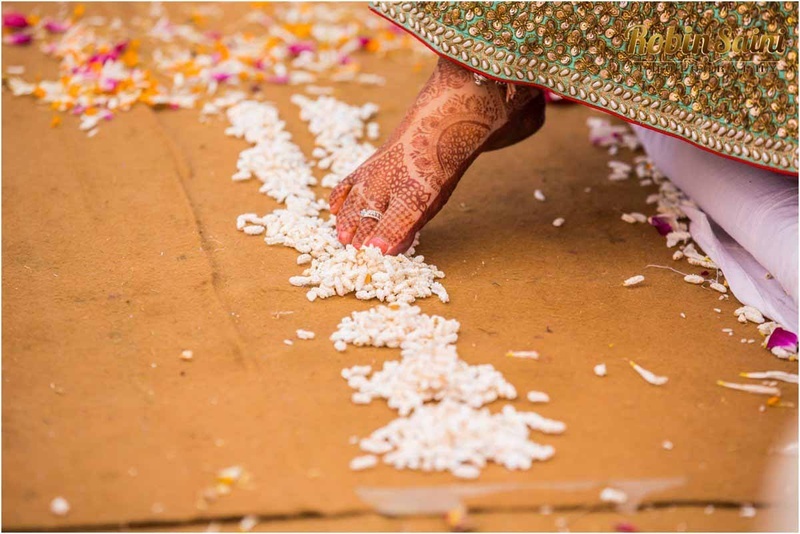 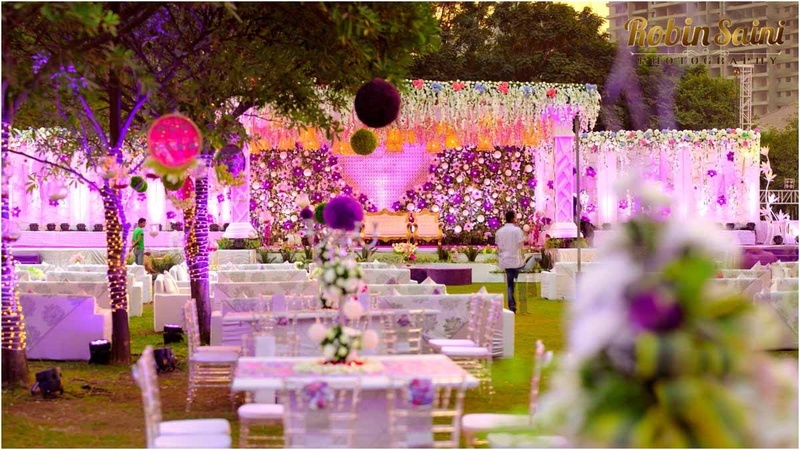 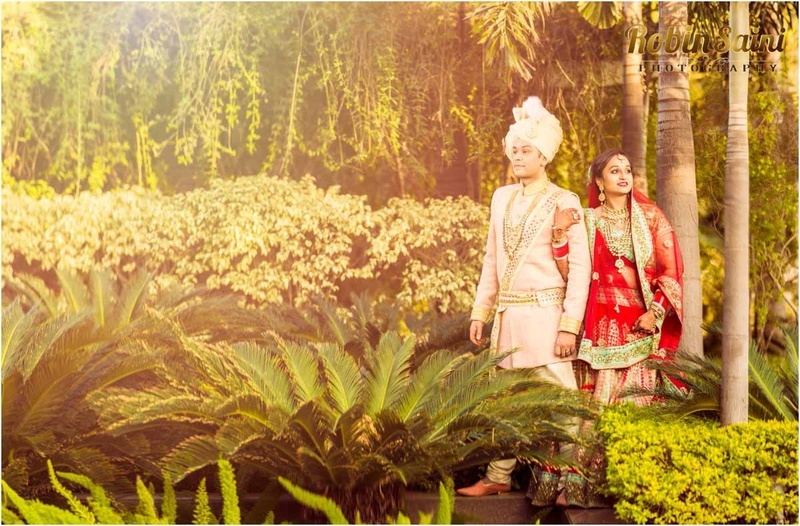 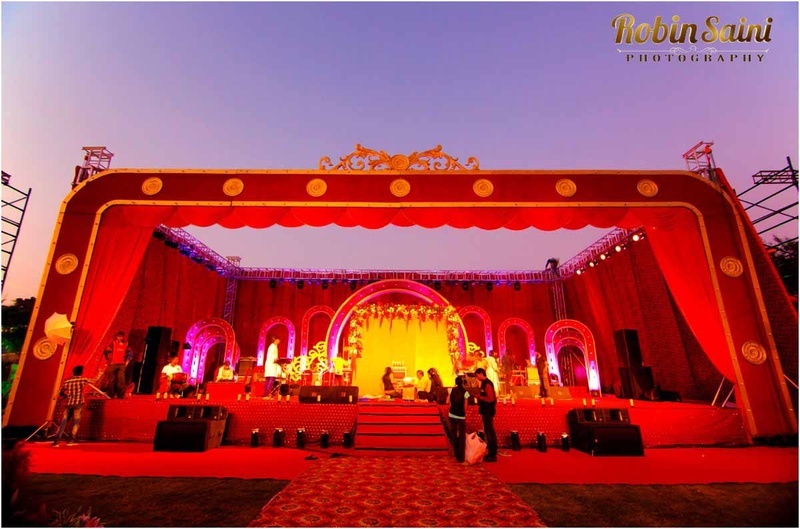 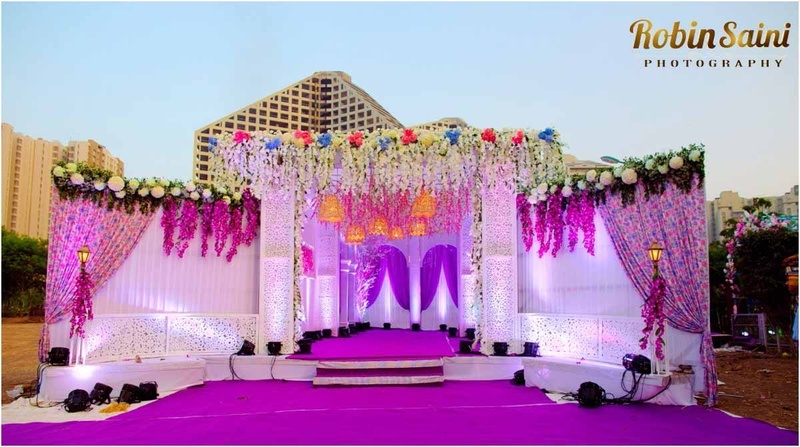 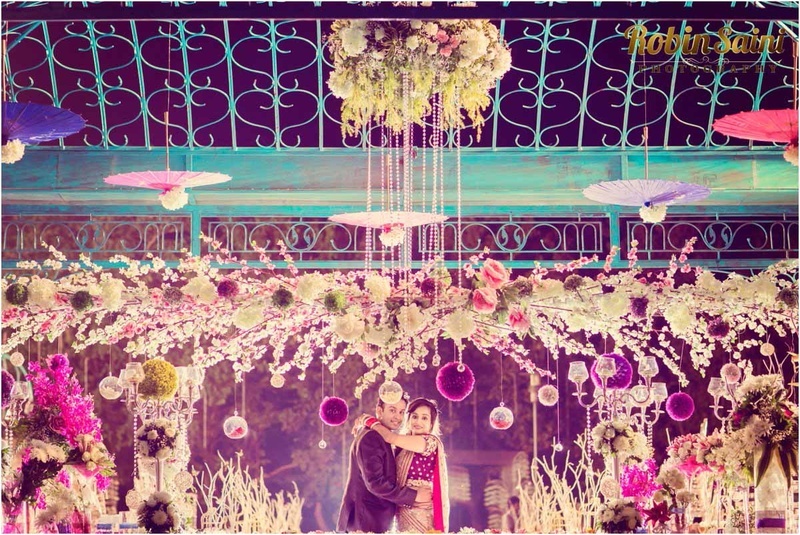 The Shaadi FRESH – was the only word we could think of when we saw Abhishek and Akruti’s outdoor wedding set up. 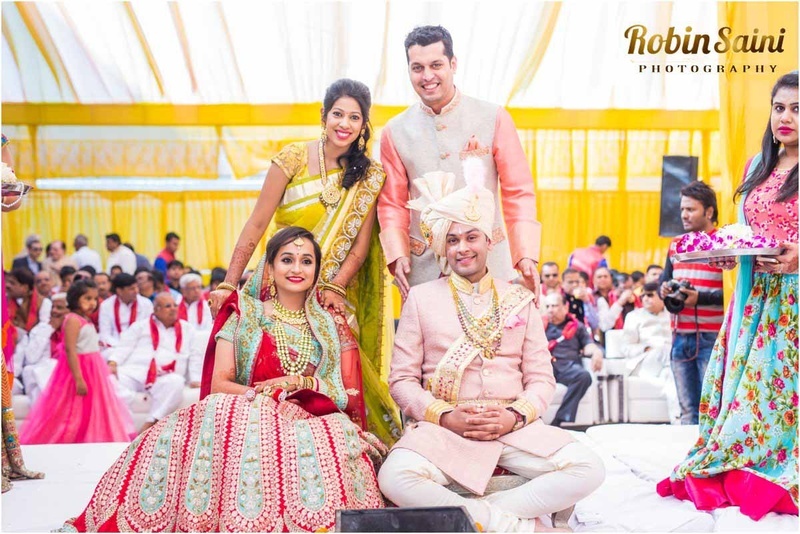 Bright yellow was a perfect choice of color for a December winter wedding like theirs. 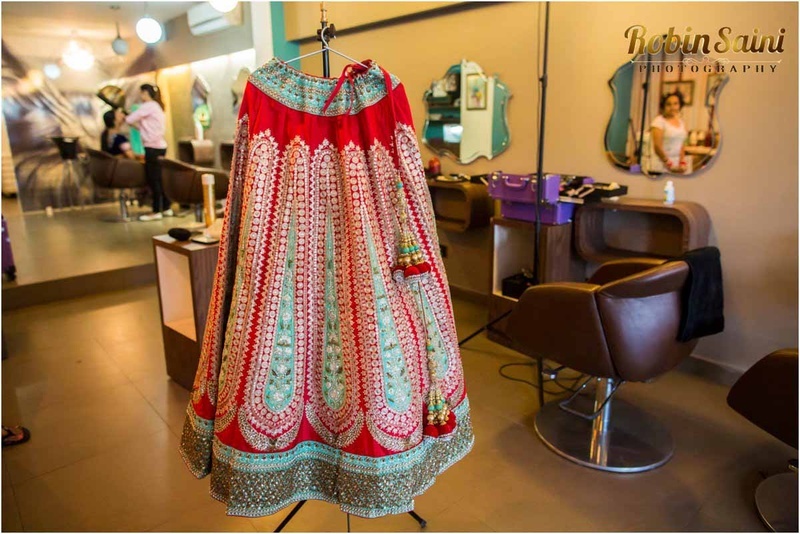 The freshness factor was visible in Akruti’s bold kalidar lehenga also – the hues of aqua with the red brought about an unconventional touch to the traditional bridal lehenga. 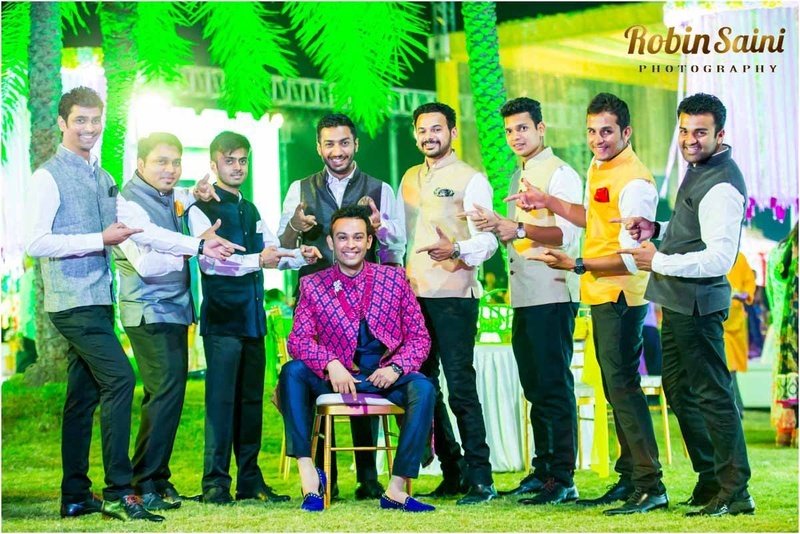 Abhishek too sported his best look in a peach and gold embroidered designer sherwani with customized jooti’s which completely stole our hearts! 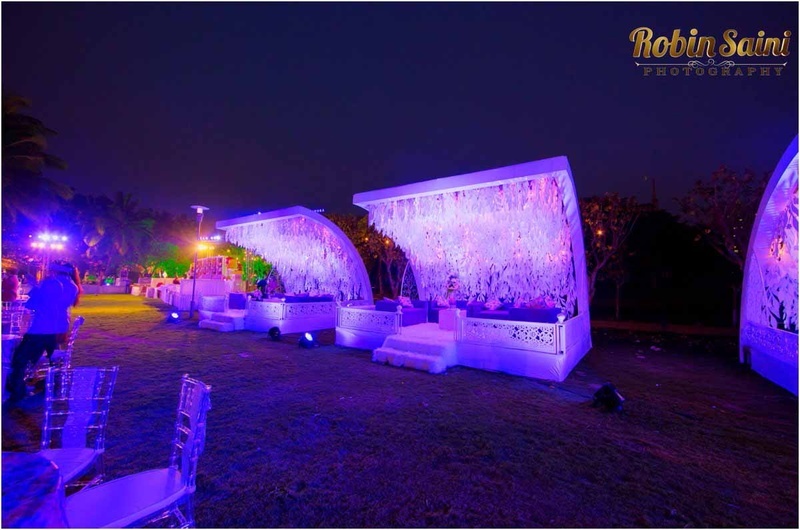 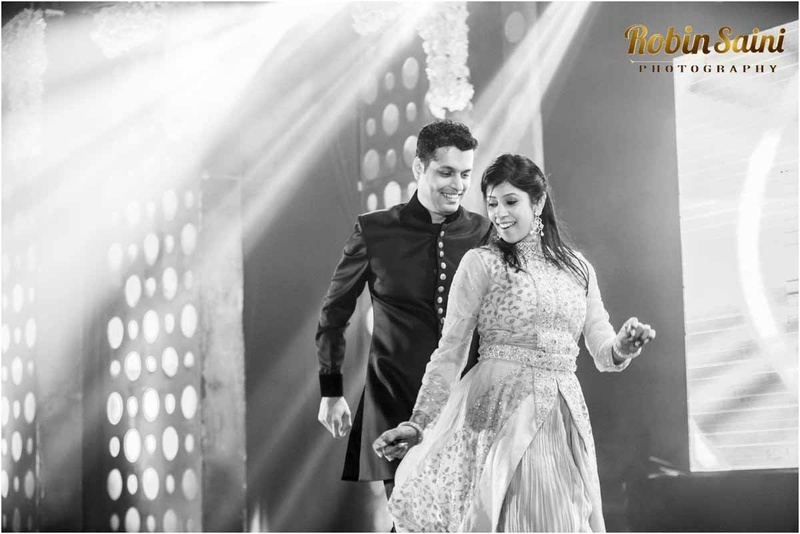 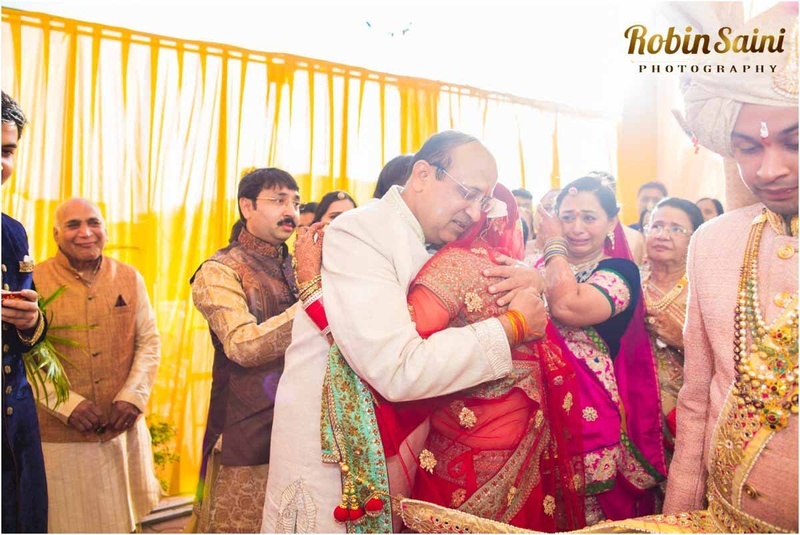 The final lap of this 10 day wedding celebration ended with the grand wedding reception held at Amanora Park, Pune. 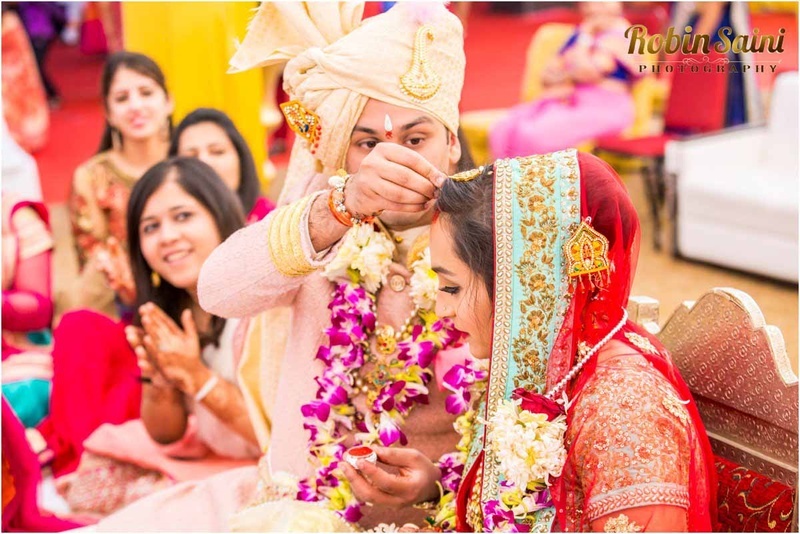 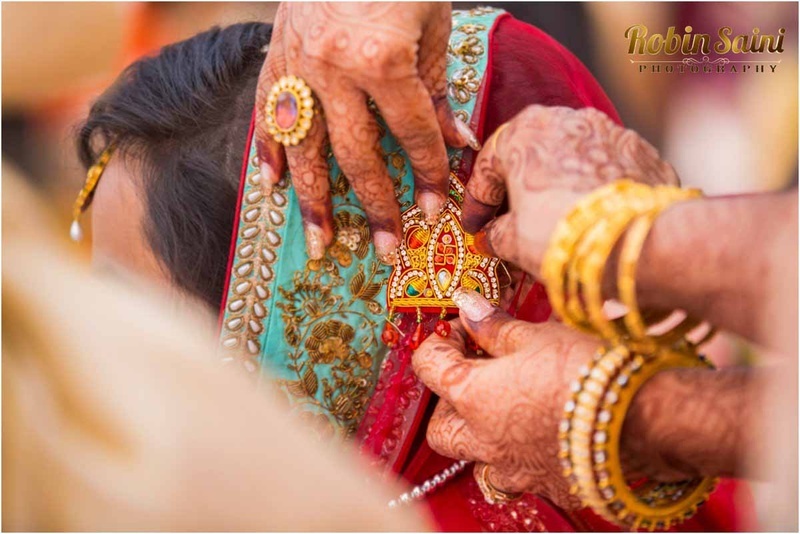 As we spotted a distinct color scheme through every wedding ceremony, we were sure that the Khinvasaras left the best for last. 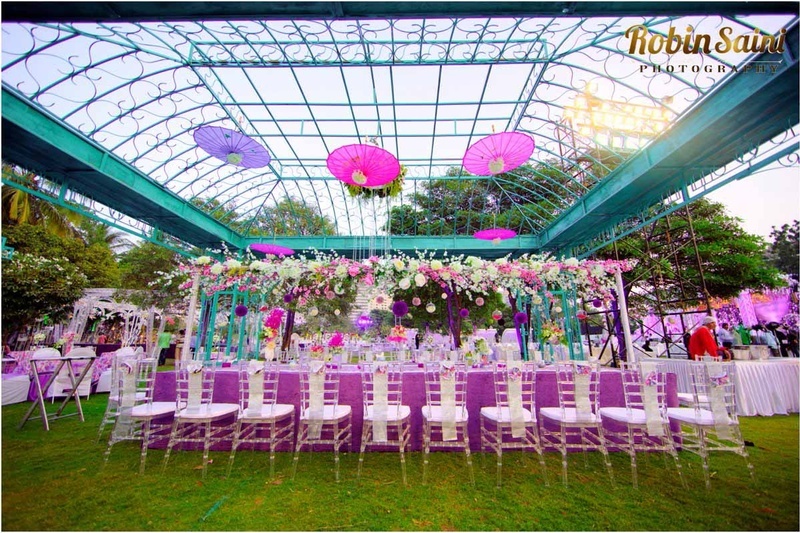 Gorgeous shades of lavender and lilac were used along with regal silvers and crystals to create a reception party oozing with splendor. 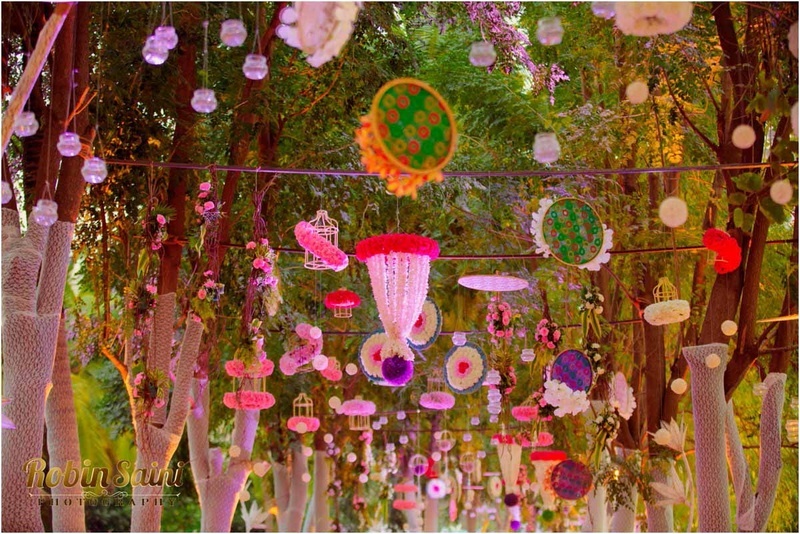 The resplendency began at the walkway entrance which was strung with birdcages, wooden embroidered hoops, and beautiful glass lamps. 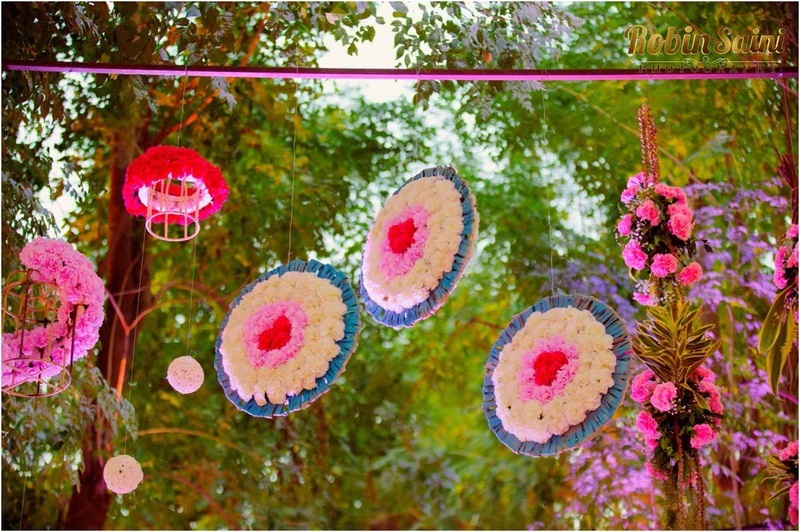 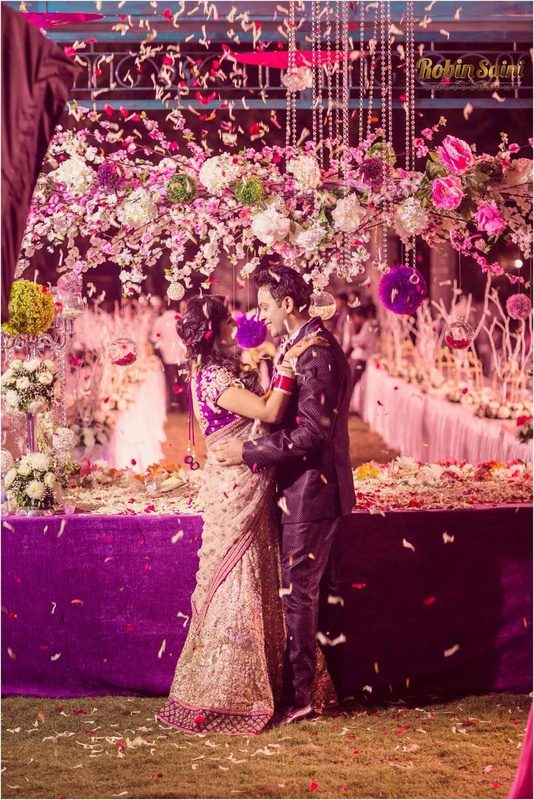 A floral wall was Abhishek and Akruti’s stage backdrop which brought back all the memories from the KimKanye wedding, with double the prettiness! 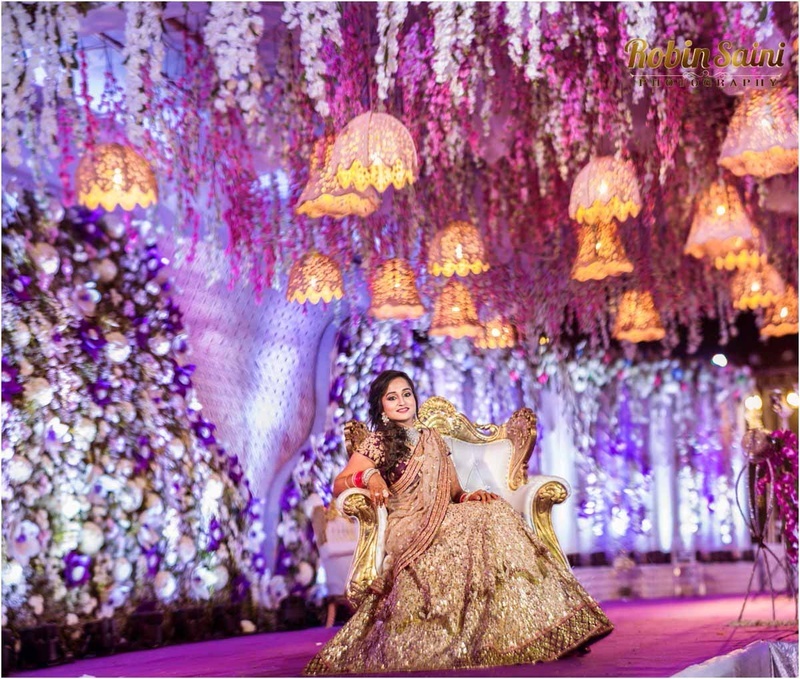 Although yellow-lit lamps and lounge areas were our favorite elements, the beautiful brides opulent gold lehenga definitely stole the show! 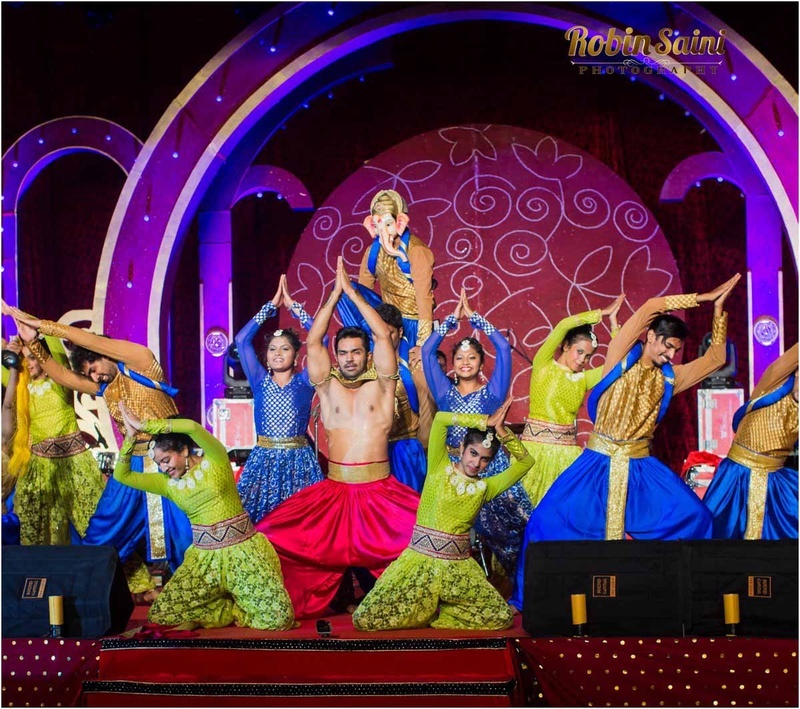 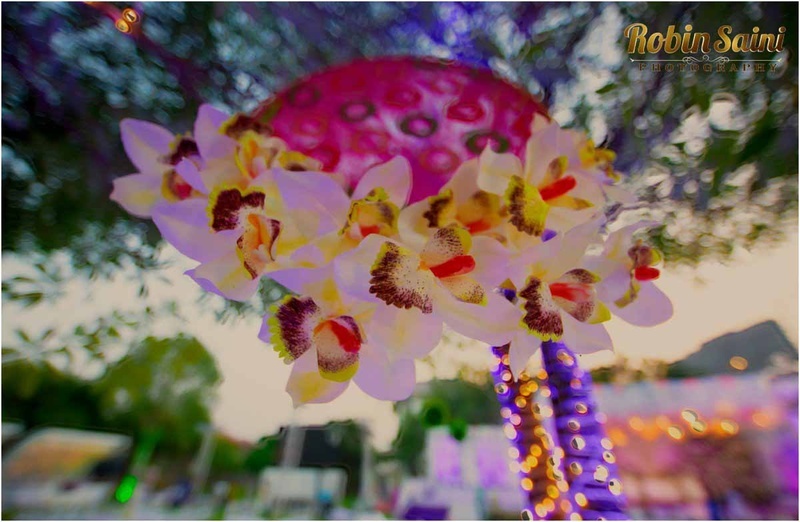 Moulin rouge themed event held at The Corinthians Resort, Pune. 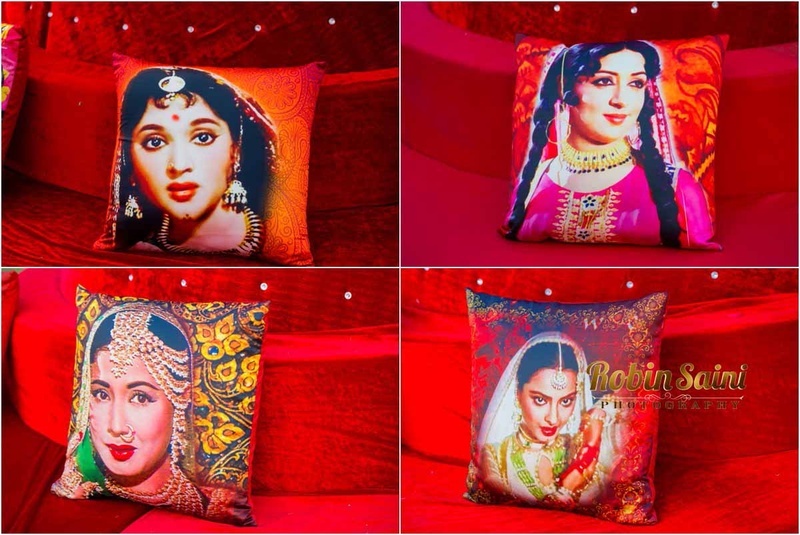 Pillow covered featuring timeless Bollywoood beauties! 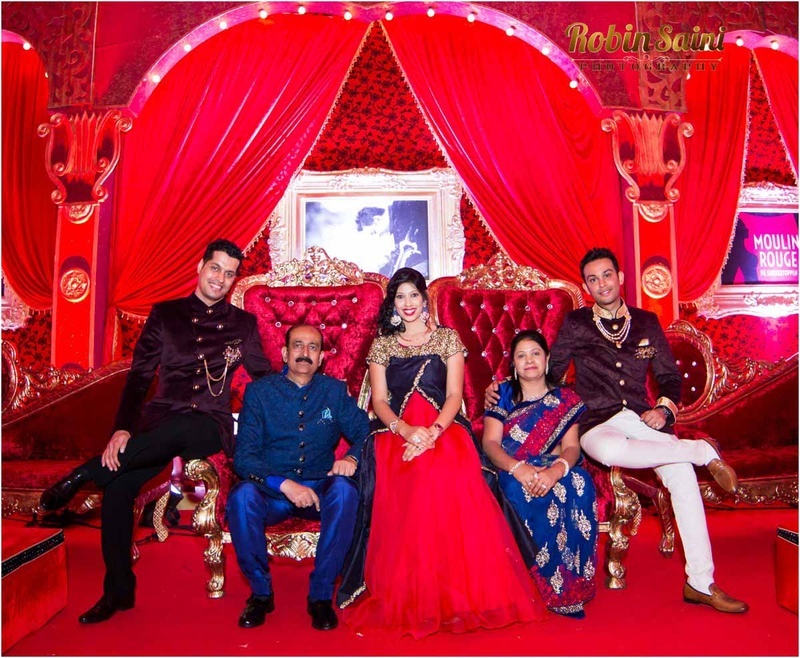 Luxury much?! 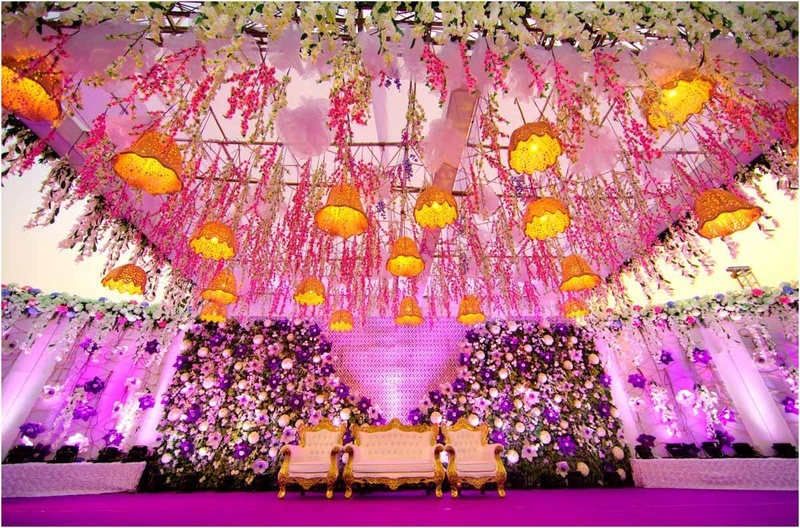 How much stunned are you on a level of 1-10, 10 being the highest? 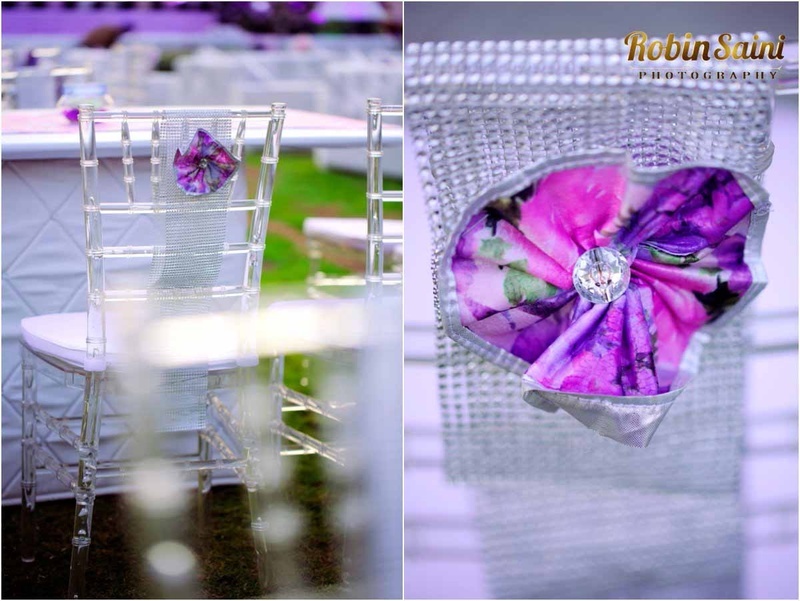 Personalized Khinvasara family logo on the airplane seat headrest covers – talk about setting the bar high! 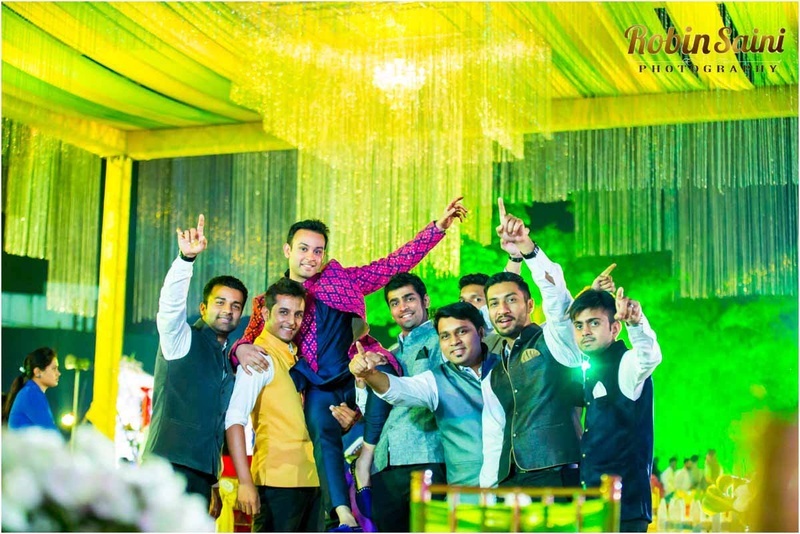 Abhishek donning a peach blazer to finally wed the girl of her dreams. 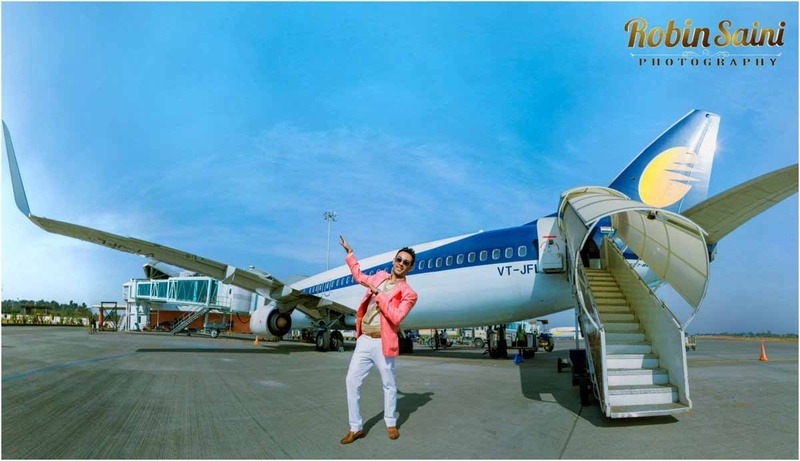 And man he does it in style!